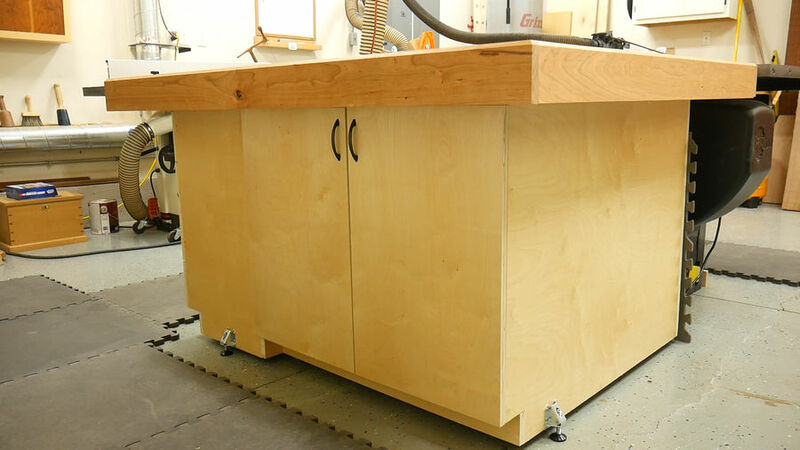 This assembly table is perfect for a garage workshop. It measures 4 feet wide by 5 feet long. 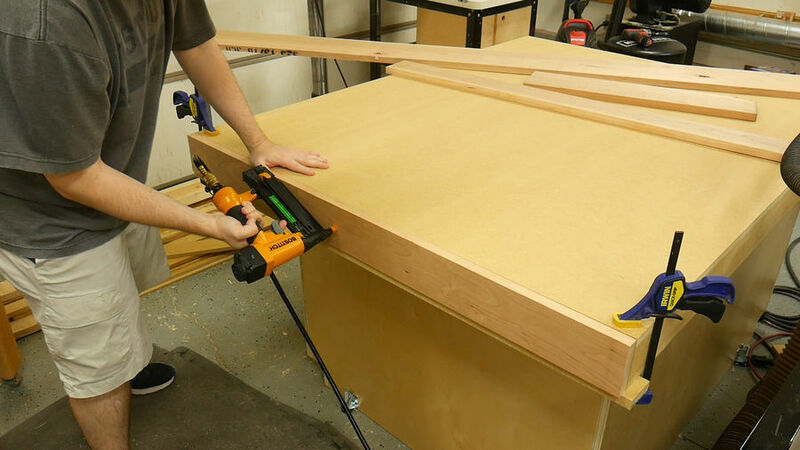 I designed this assembly table to also serve as an outfeed table since I don't have the room for two dedicated tables. 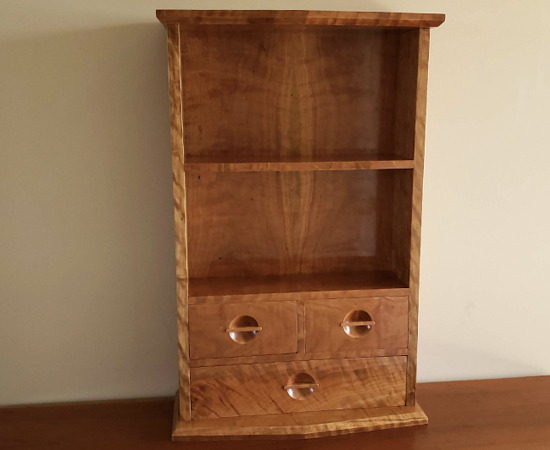 It features eight drawers on the left side of the cabinet and two big compartment with adjustable shelves on the front of the cabinet. Showcase photo of the completed project. 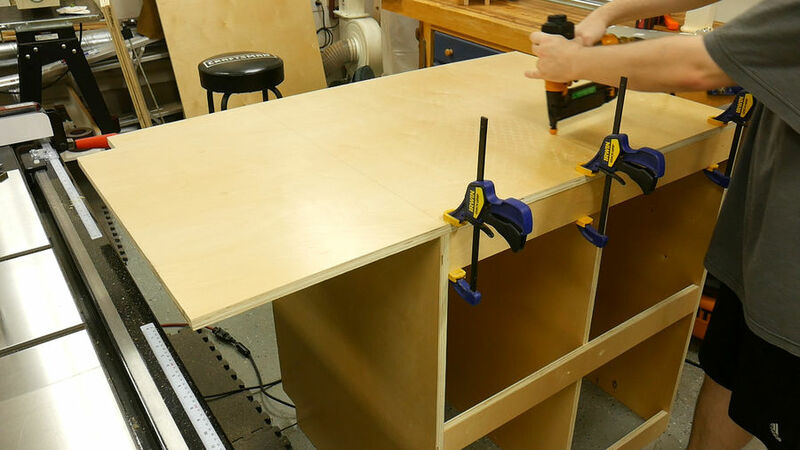 I built the assembly table using 4 sheets of 3/4" plywood and 3 sheets of MDF. 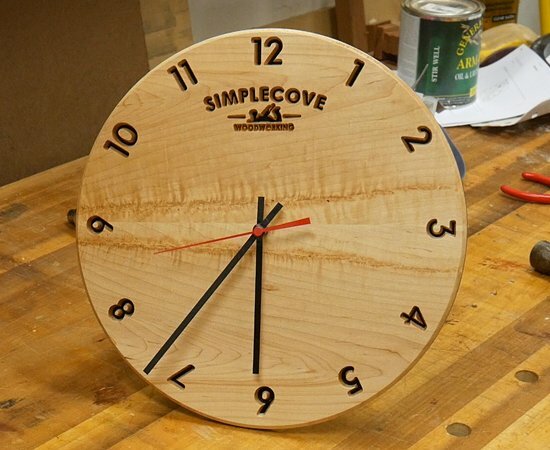 I opted to use pre-finished plywood because it was cheaper than shop grade birch at my local hardwood dealer. 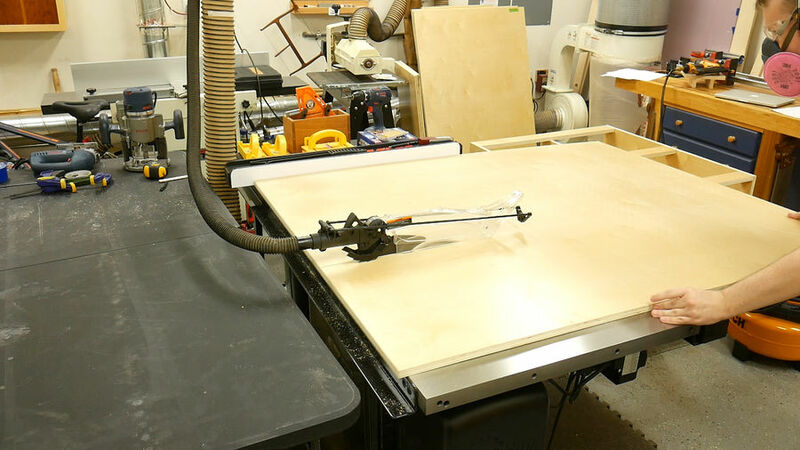 Since I had all of this plywood laying around in my shop the first thing I did was break it down to smaller pieces with my track saw. I laid everything out to maximize the crosscuts. 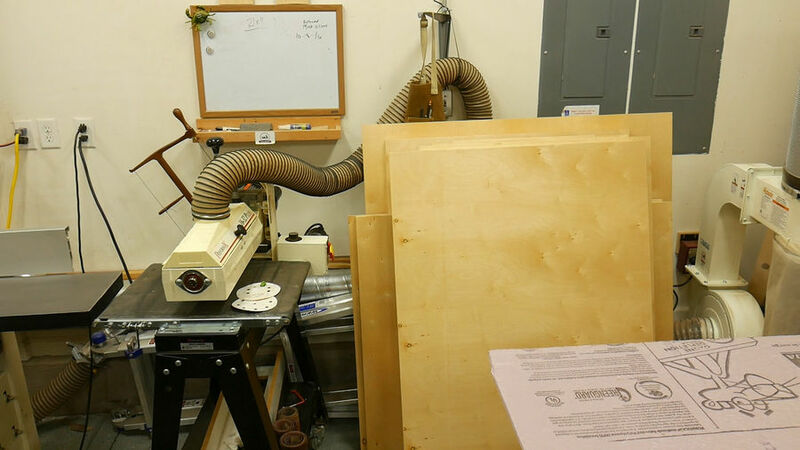 When breaking down the sheet goods, I made sure to put a piece of tape and write down which sheet of ply it came from so I know what parts are where after i'm done. This part of the project probably took me a couple of hours but in the end it was worth it because I really don't have room for full length sheets of plywood. 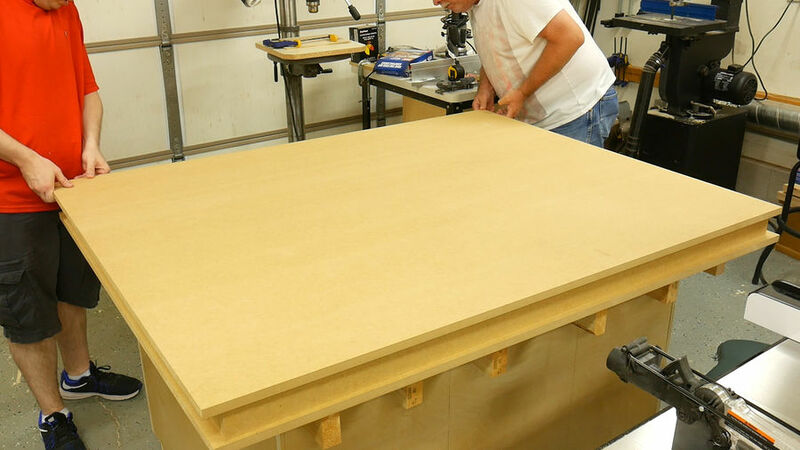 And as you can see, this is what 4 sheets of plywood look like once cut down. 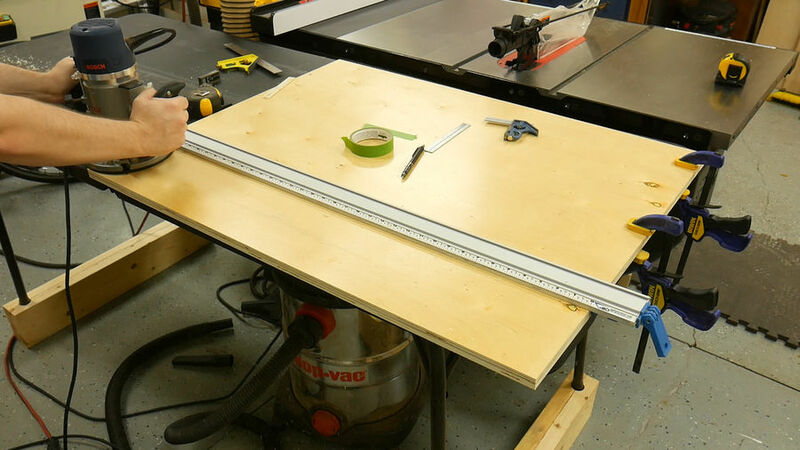 With the parts in a more manageable size, I begin by cutting the side panels to Width at 29 inches. 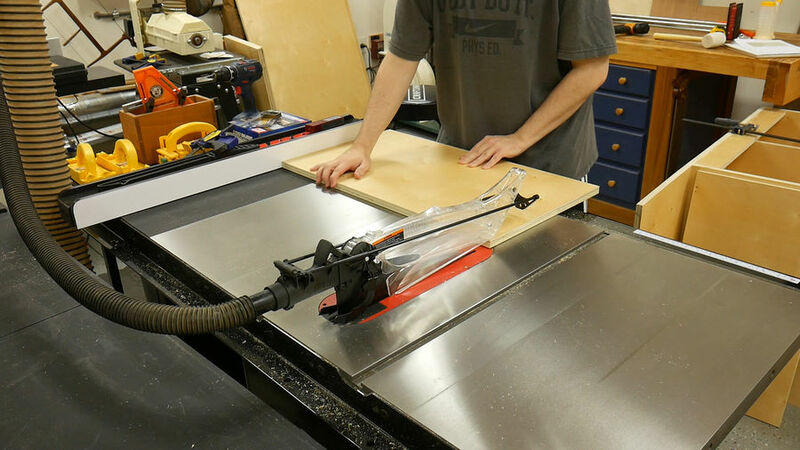 I used the track saw when breaking the sheet goods down to cut this panel to length of 37 and a quarter inches. I cut two pieces at this width. Next I reset the fence to 28 1/4 and to cut the center divider. 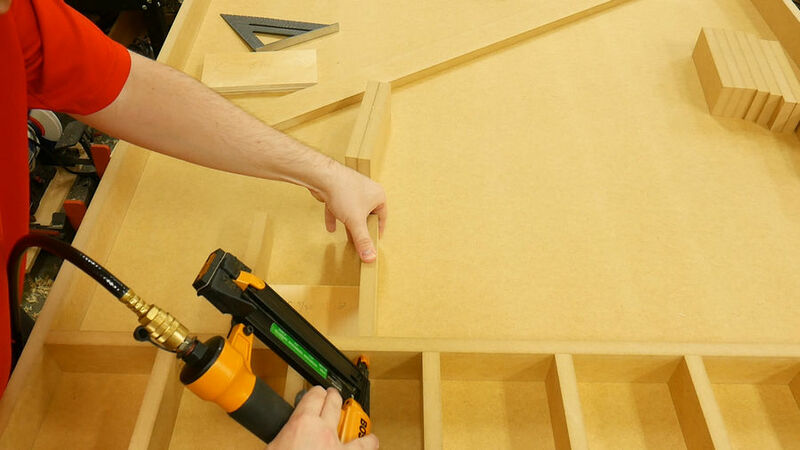 Its important to note that the center divider is 3/4" of an inch shorter than the side panels. 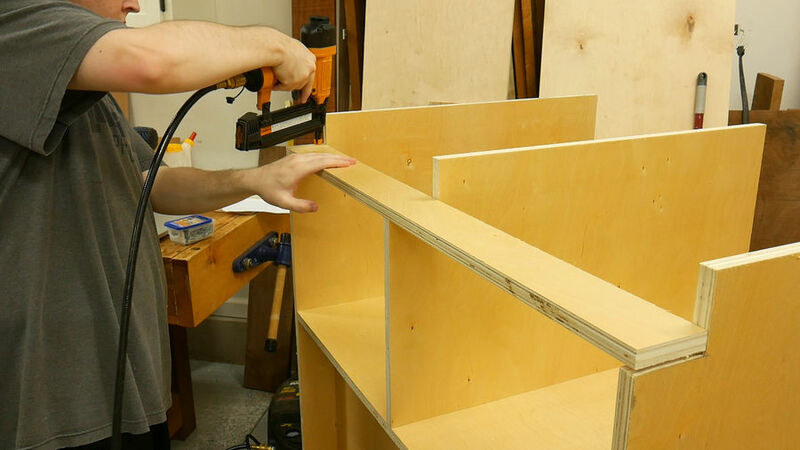 With the side panels and center dividers cut to size, I change gears and route the grooves for the bottom shelves. 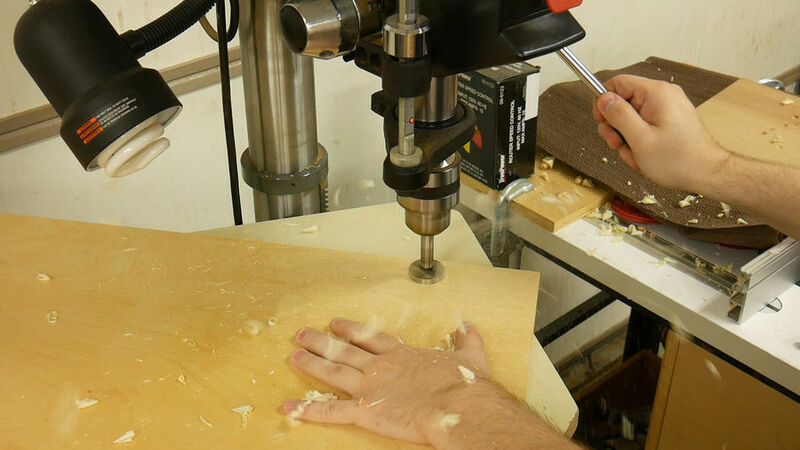 To make the grooves i'm using my plunge router with a 23/32 router bit specifically made for plywood. 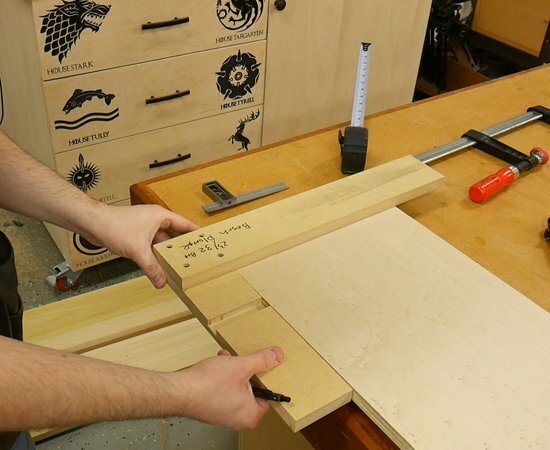 I clamp the edge guide in place and set my combination square to the distance from the edge so I can quickly set the edge guide on the other panels and make sure its going to be in the same exact location. 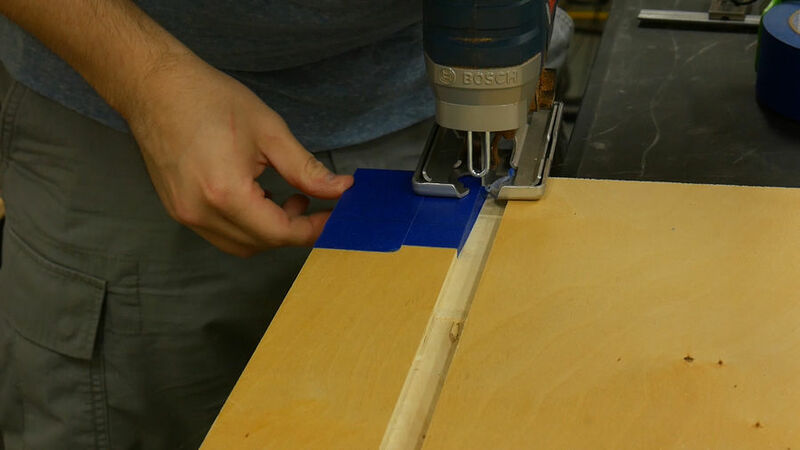 This is especially important for the center divider because it will get a groove on both faces in the same location. With the grooves cut I begin cutting the 3 by 3 toe kicks in the center divider and one of the side panels. 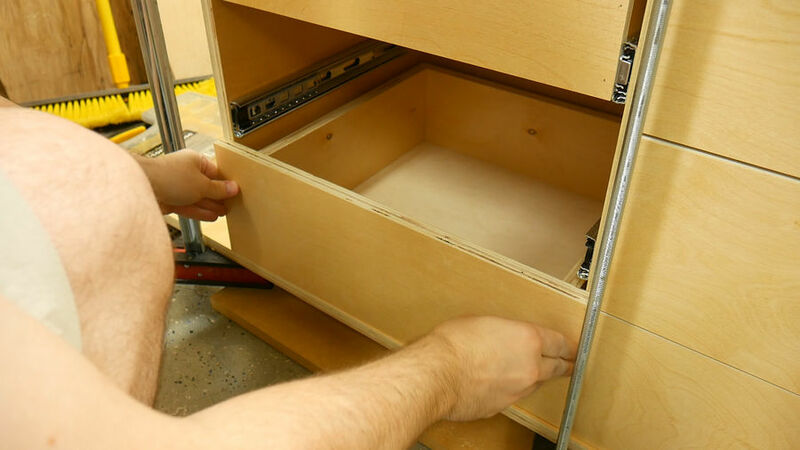 The side panel that meets the drawer compartment doesn't get the toe kick removed as you can see in this picture. 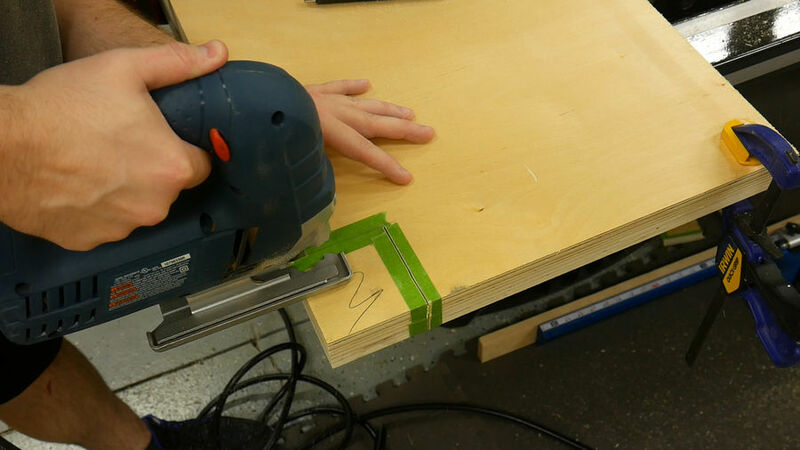 To begin, I put a piece of masking tape on both sides of the panel to prevent any tear out. 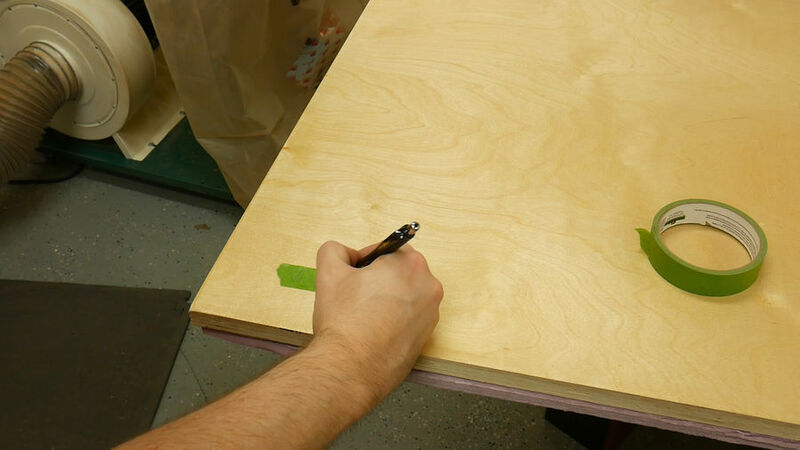 I then make a mark 3 inches from the edge and bottom of the panel. And I then use the jigsaw to remove the waste. 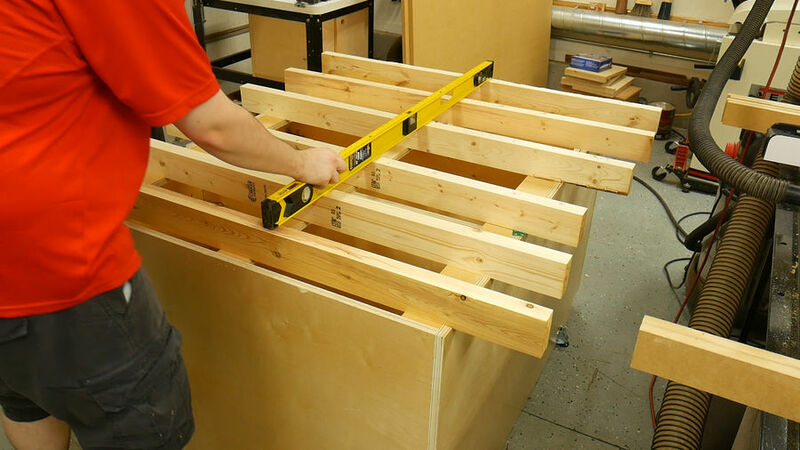 I repeat these same steps for the center divider. 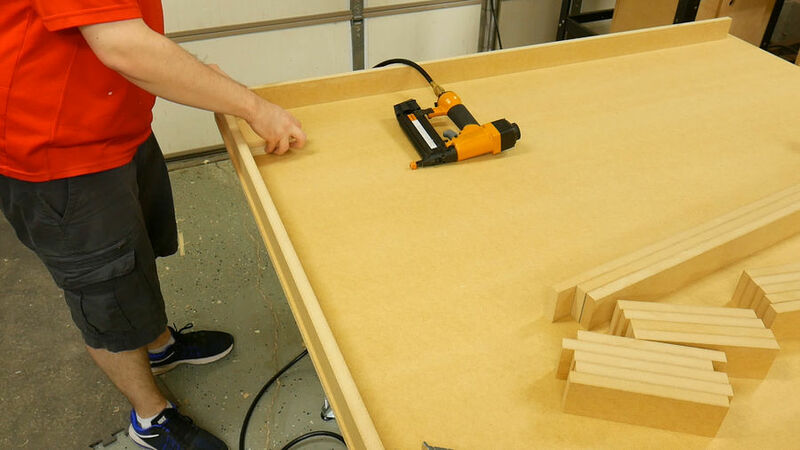 Before I assemble the cabinet I needed to drill for the shelf pins since I wanted an adjustable shelf. 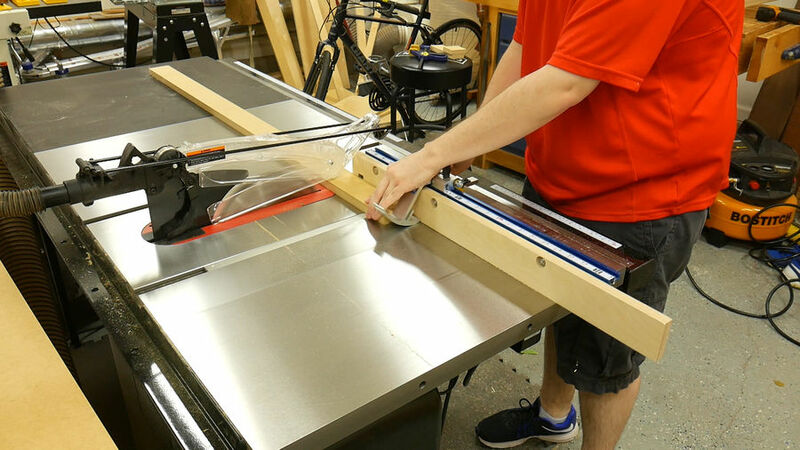 I made a center mark between the top of the panel and the top of the groove to align the shelf pin jig. 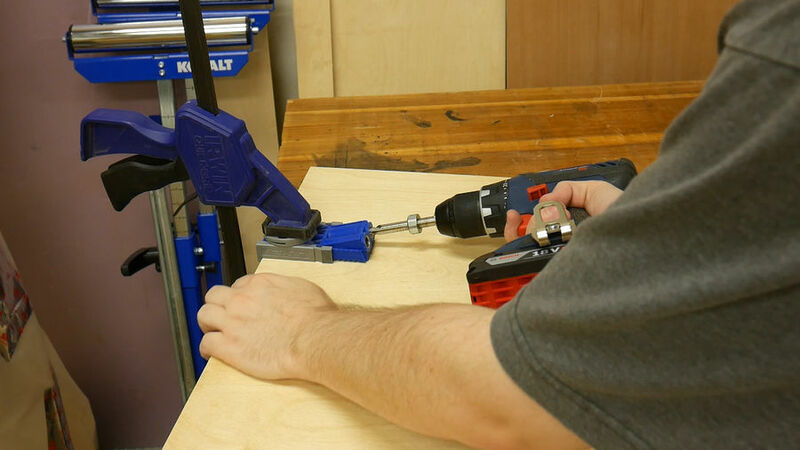 For this operation i'm using the Kreg shelf pin jig and a 1/4" brad point bit. 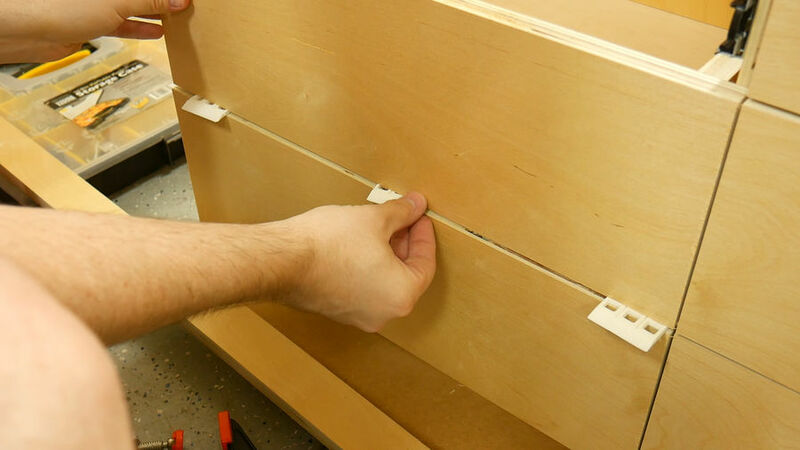 It's really important to note that since the center divider is 3/4 of an inch shorter, you will need to move the shelf pin holes 3/4" of an inch closer to the top edge of the panel. 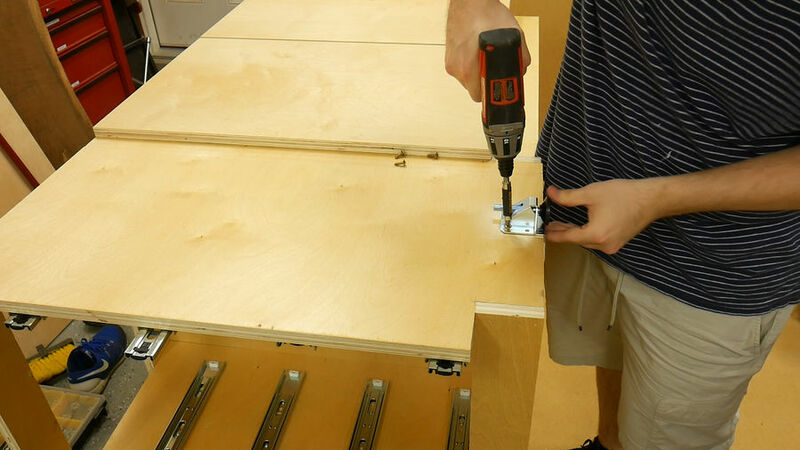 If you don't move the jig closer to the top edge, the holes will be lower on the center divider than the side panels. 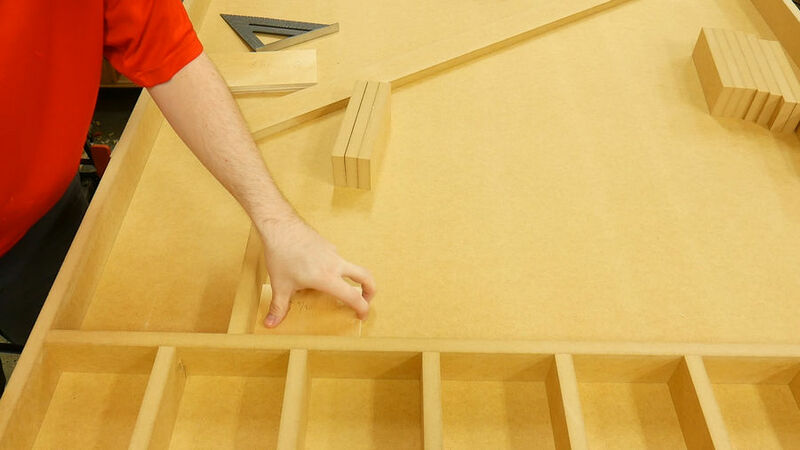 The last pieces I needed to cut before assembly were the bottom shelves. 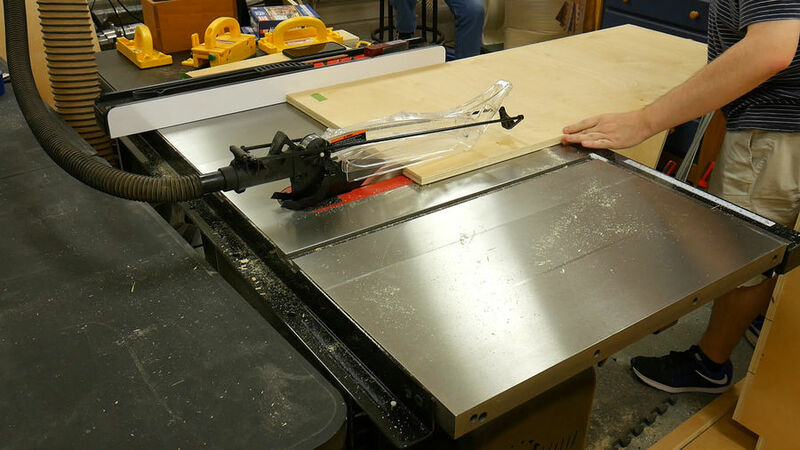 To begin the glue up I first put glue in the dados. 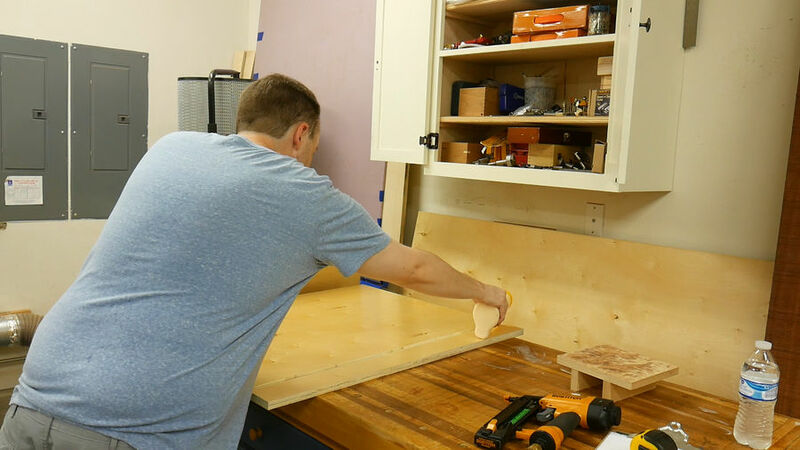 Next I placed the bottom shelf in the dado and made sure it was flush with the front of the side panel. 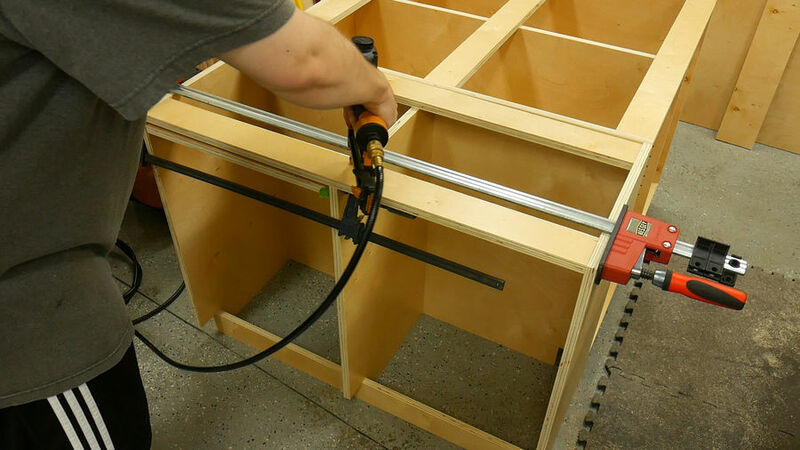 I placed a scrap piece of wood under the bottom shelf and began putting glue in the dado on the center divider. To hold everything in to place I used 2 inch long 18 gauge brad nails. 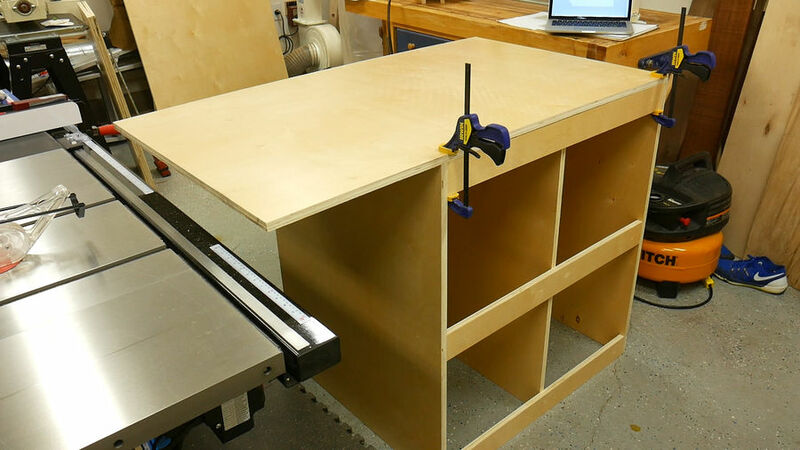 With the assistance of a shop helper, I put the bottom shelf in the center dividers dado and added a couple of clamps to help hold everything together before adding the brad nails. 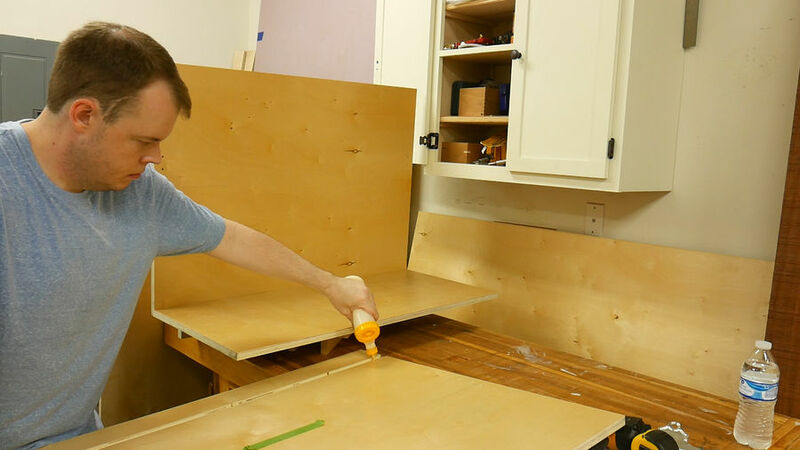 And to attach the second half of the bottom cabinet, I placed glue in the dado, attached the shelf and then attached the second panel, again, with brad nails. 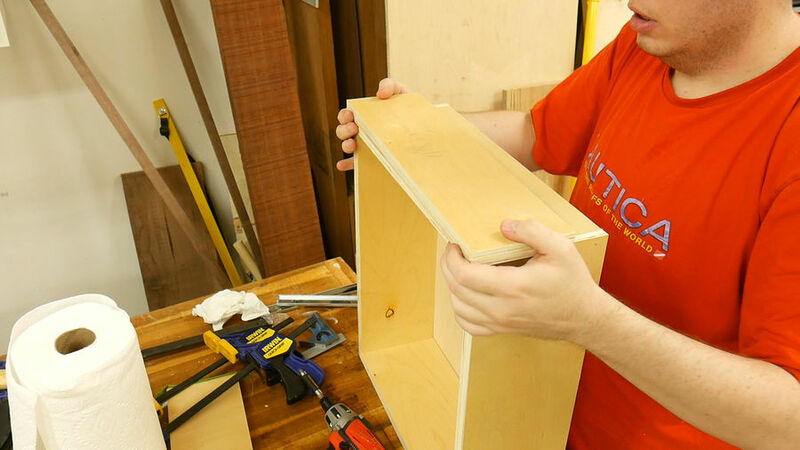 With the cabinet assembled I cut 3 structural support pieces to nail across the top to add stability to the cabinet. They are 3 inches wide and 32 3/4" long. 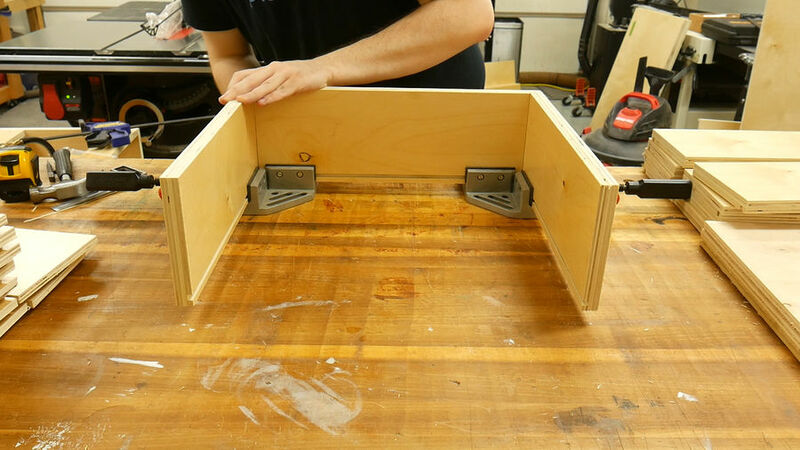 To attach the supports I place them down on the center divider and make sure they are flush with the top of the side panels and nail them in. 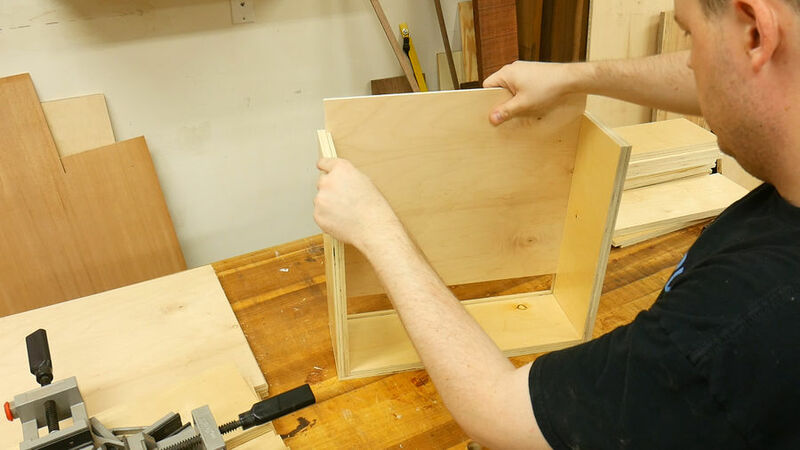 The front support should also be flush with the front edge of the cabinet. Next I drilled a few pilot holes to attach the base to the top . 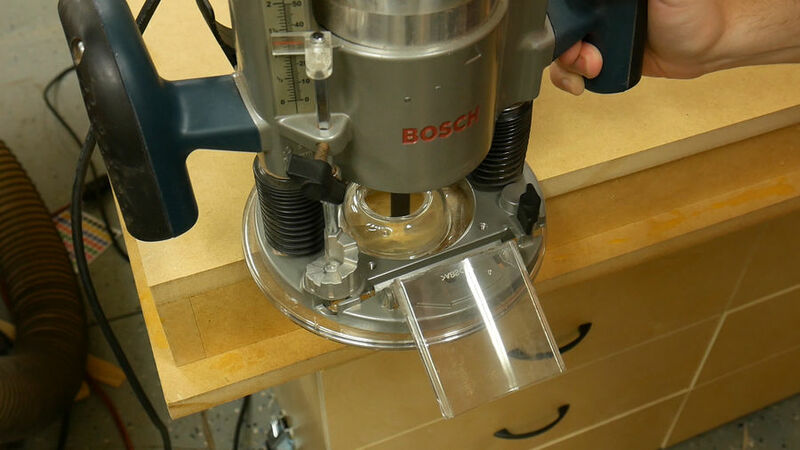 I started by drilling from the top so that when I made the countersunk holes on the bottom It would be easier. 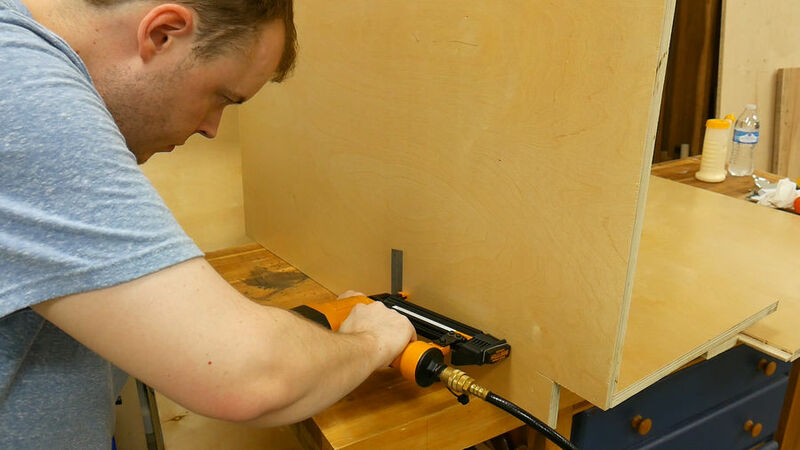 Now the best thing to do would have been to drill these holes before attaching the structural supports, but I always do things the hard way the first time. 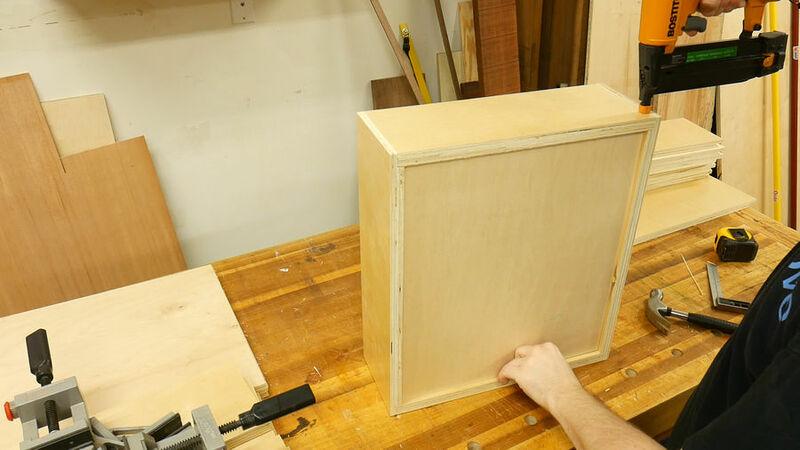 Next I switched gears and cut the back panel of the cabinet. 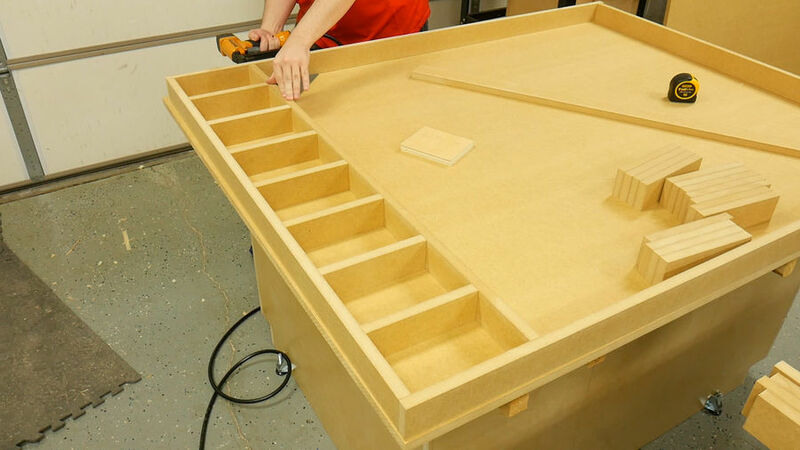 This is the panel that spans the full length of the cabinet and is also used as a drawer compartment panel. 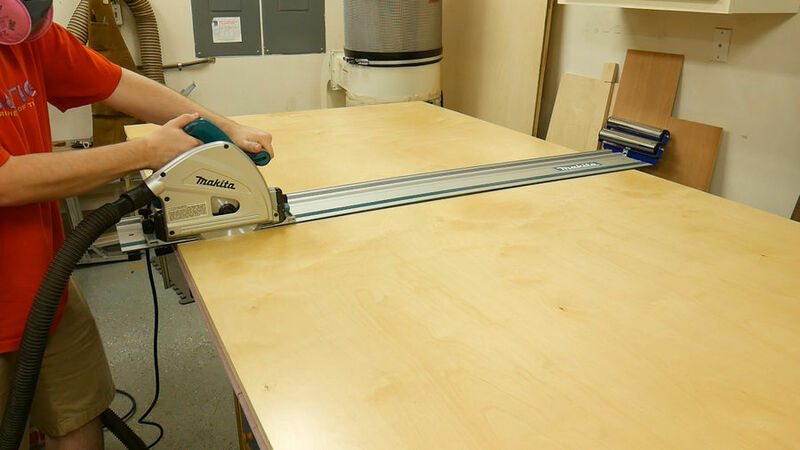 I used the table saw to cut it to width of 29 inches and then the track saw to cut it to length of 50 inches. And as you can see, this is exactly why I need an assembly table. 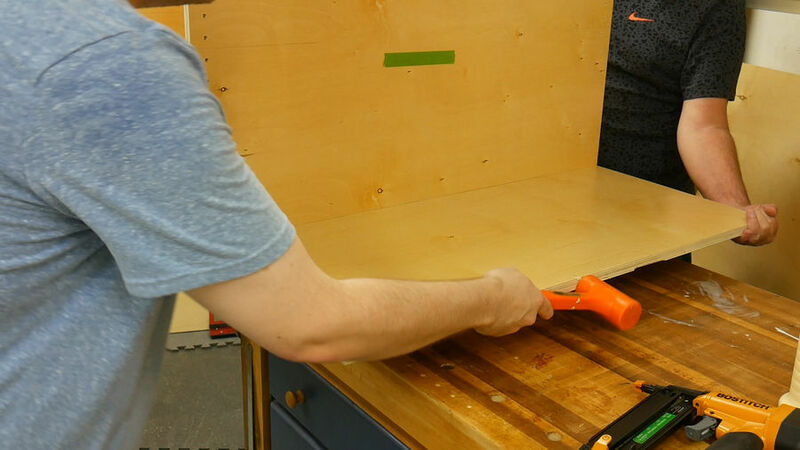 The fold out table I was using was way to flimsy for tasks like this. 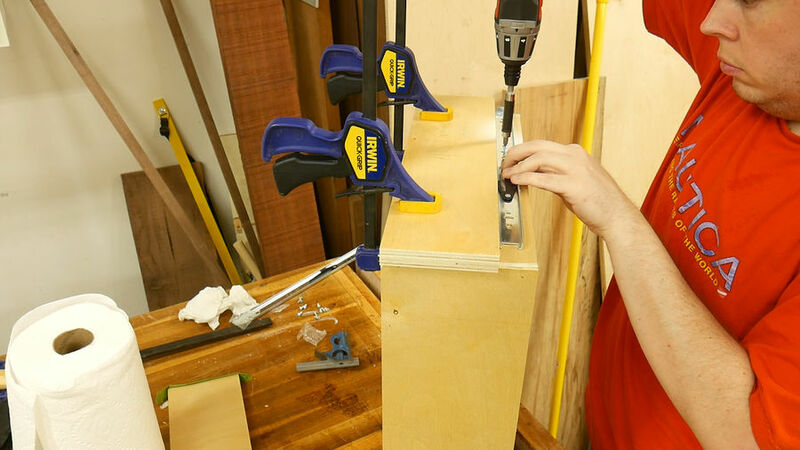 I clamped the back panel on to the cabinet while I cut away the toe kick. 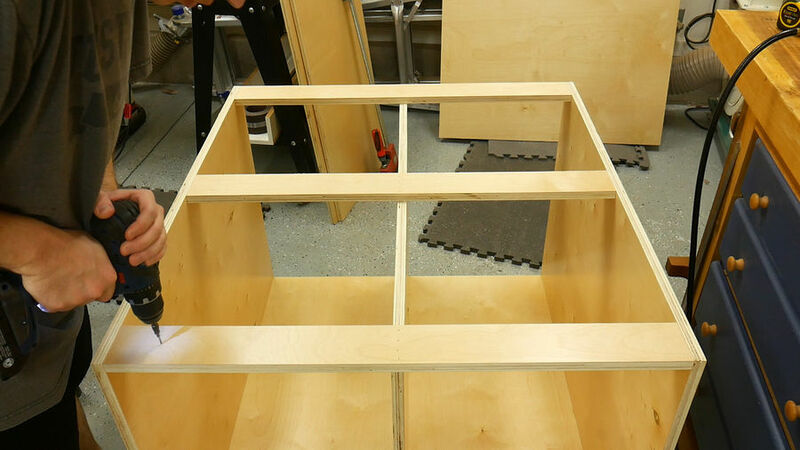 Before attaching the back panel you need to think about which side you want the drawers on. 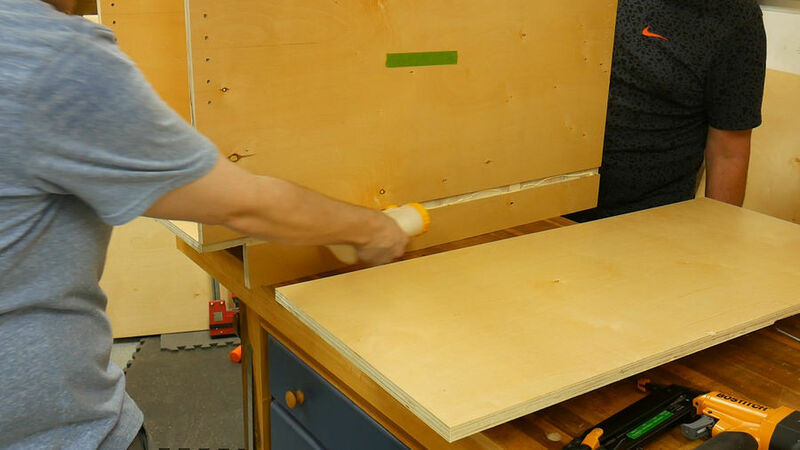 The way that I placed the toe kick, I had my drawers on the left side of my cabinet. 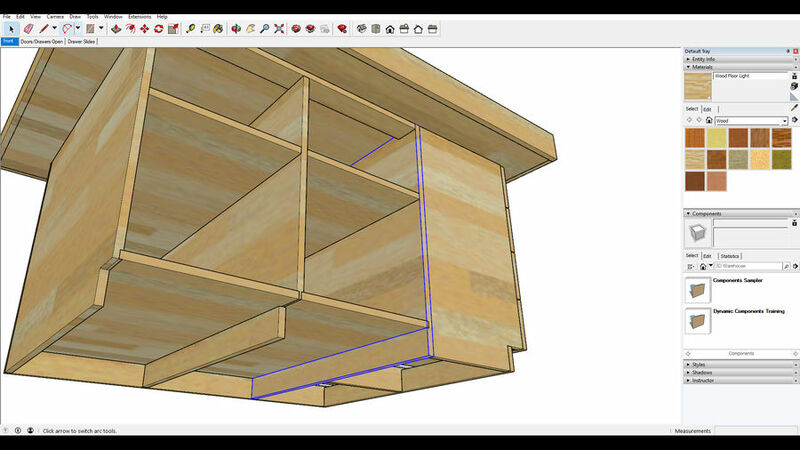 But if you want your drawers on the right, you will need to flip the panel to the opposite side of the cabinet. 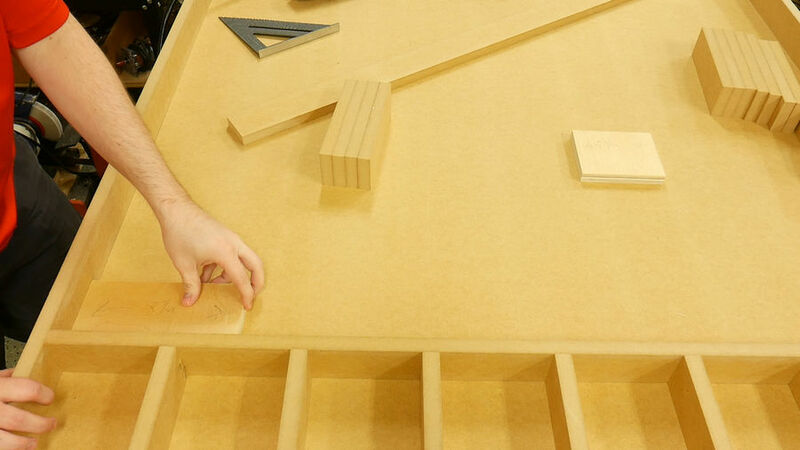 I draw a few reference lines and attach the panel with brad nails. 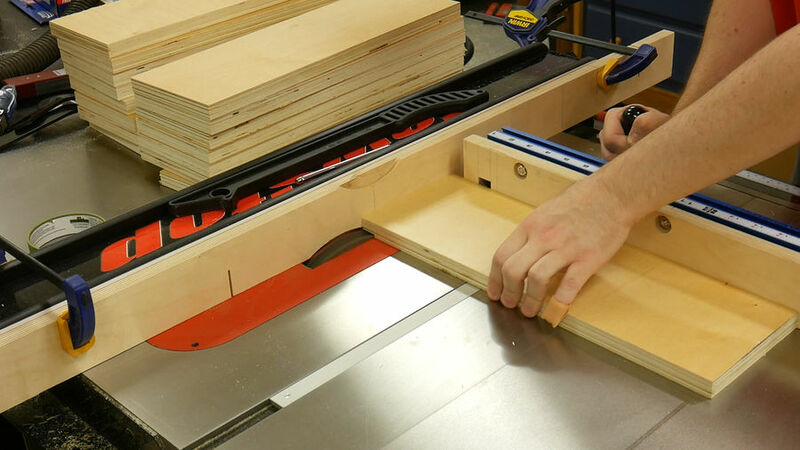 Moving on to the drawer compartment I cut the panels to length. the center divider again is 3/4" shorter than the other two panels for the structural supports so I adjust the fence to 28 1/4? and make the cut. And like the other panels, I cut the 3x3 toe kick. 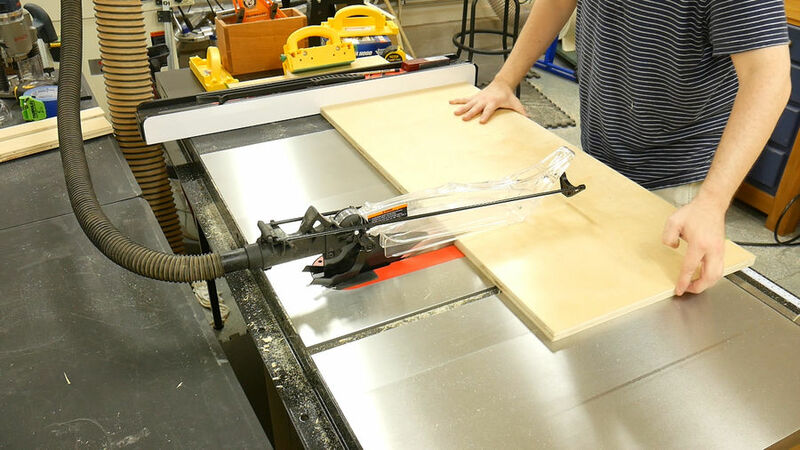 I clamped the two panels together and cut them both at the same time. 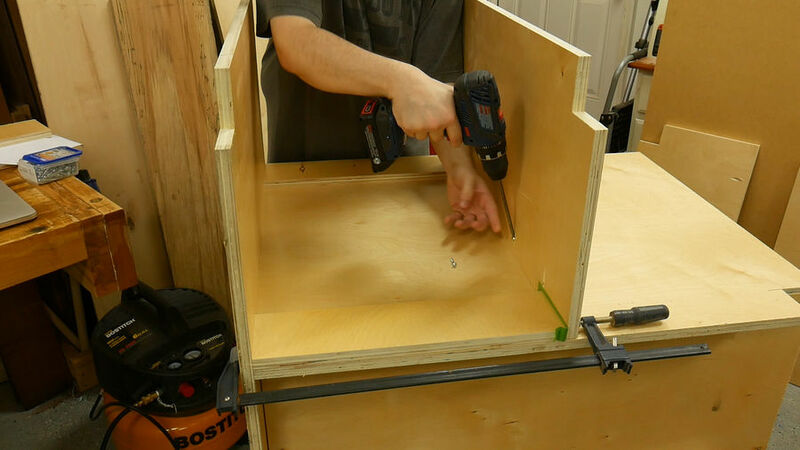 To attach the drawer compartment panels I used pocket holes. It's a fast and secure way to attach them. 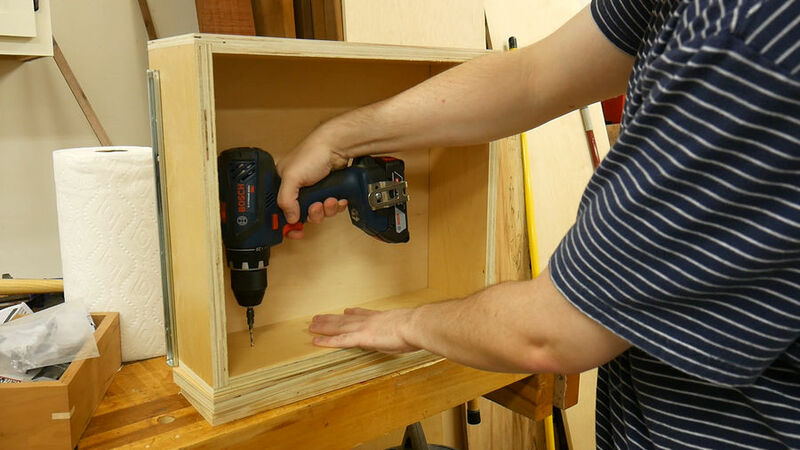 I drilled 4 pocket holes on the side panel as well as the center panel. 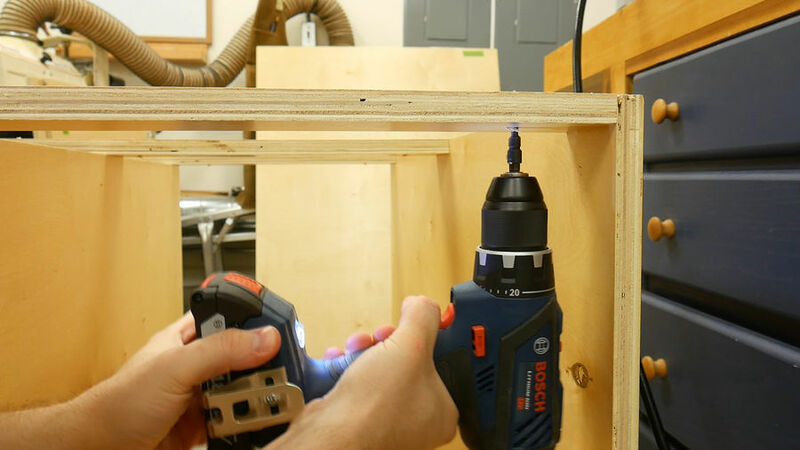 It's important to drill the pocket holes on the correct face on the side panel but on the center divider, you can drill on either side of the board. 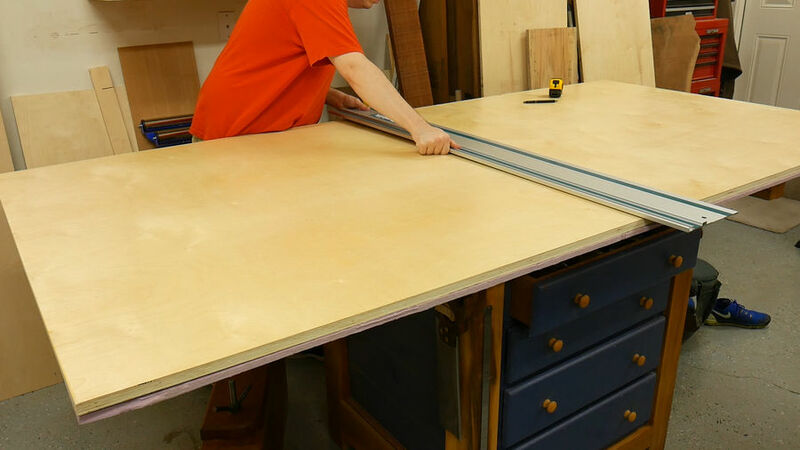 To assist in spacing the two panels, I cut a couple of spacers to 17 7/8" inches long. I added some green tape to the end of the panels because I removed a little too much off of the length. 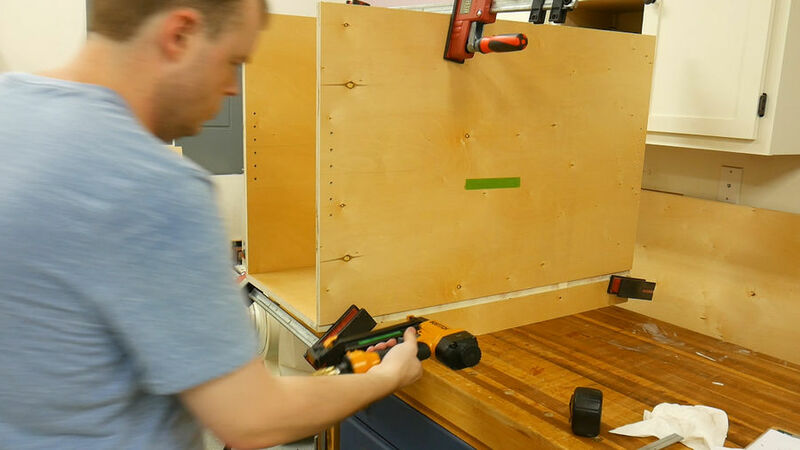 With the panel placed up against the spacers, I hold it in place with a clamp to prevent it from moving when adding the screws. 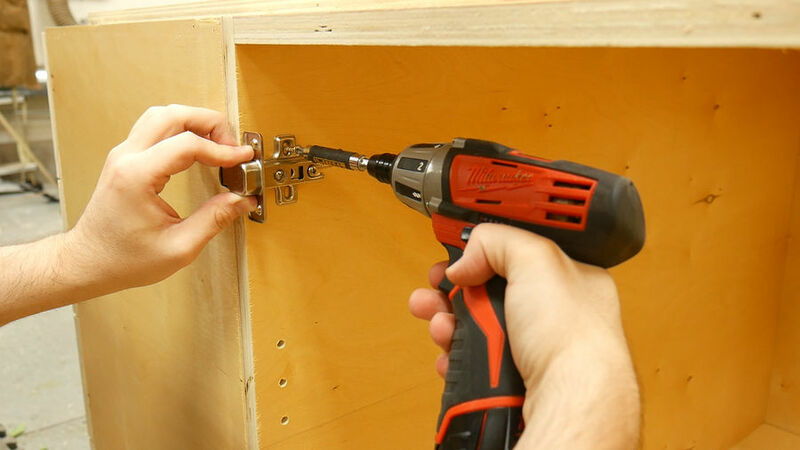 This is an important step because the first time I installed the center divider it moved so I had to re-drill the pocket holes and install it again. To attach the panels I used 1 1/4" inch pocket hole screws. 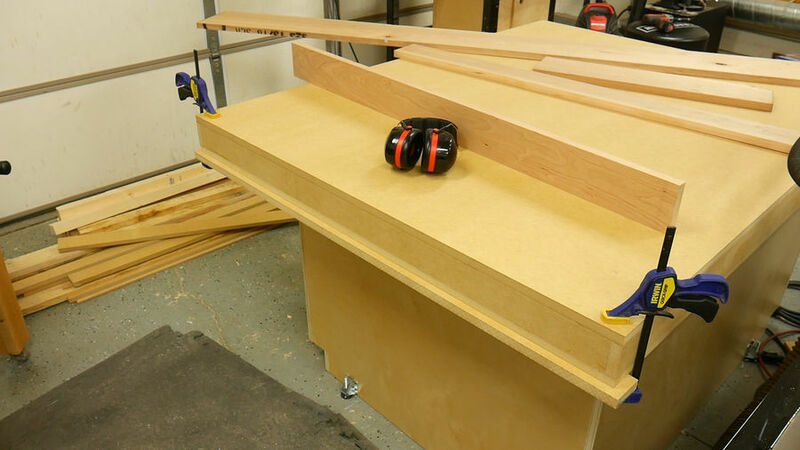 With the cabinet on it's back I went ahead and cut the toe kick panel to size and attached it with brad nails. 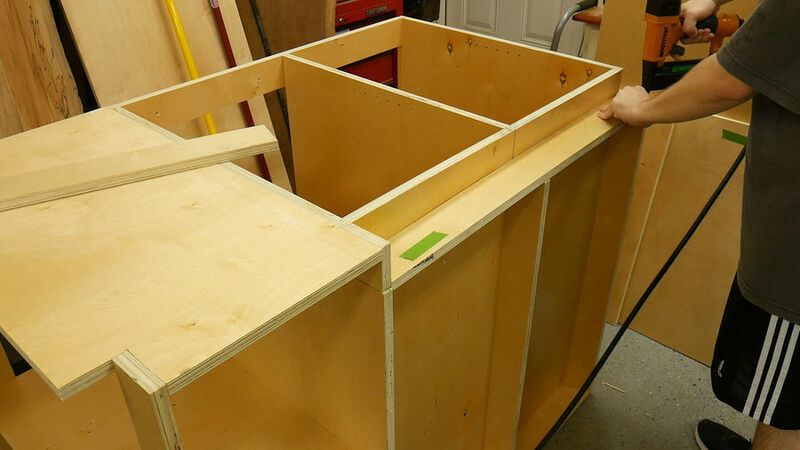 Next I flipped the cabinet back over and installed the structural supports in the drawer compartment, again making sure they were flush with the top of the panels and the front of the cabinet. 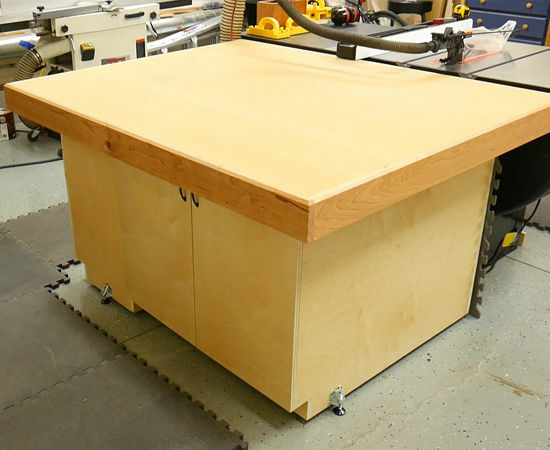 And finally I put the cabinet on it's back and installed the final toe kick panel. So moving on, I started breaking down the parts for the drawers. 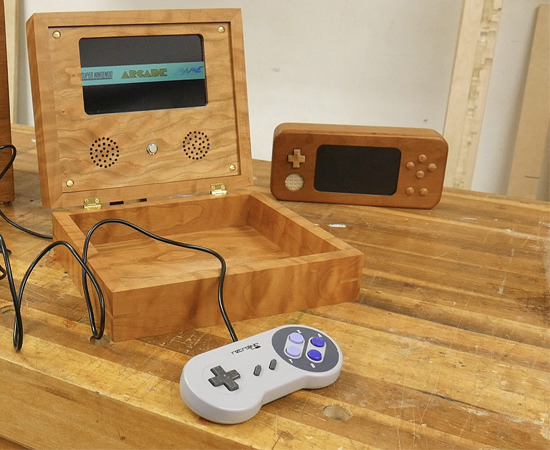 All of the box parts are the same 3/4" plywood and for the bottom panel I used 1/4" plywood. 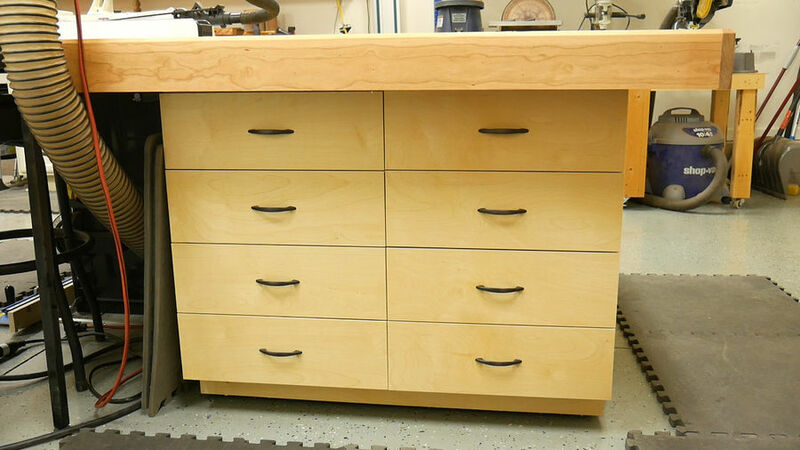 For the joinery I wanted something quick and easy so I went with half laps on the front and back drawer box panels. 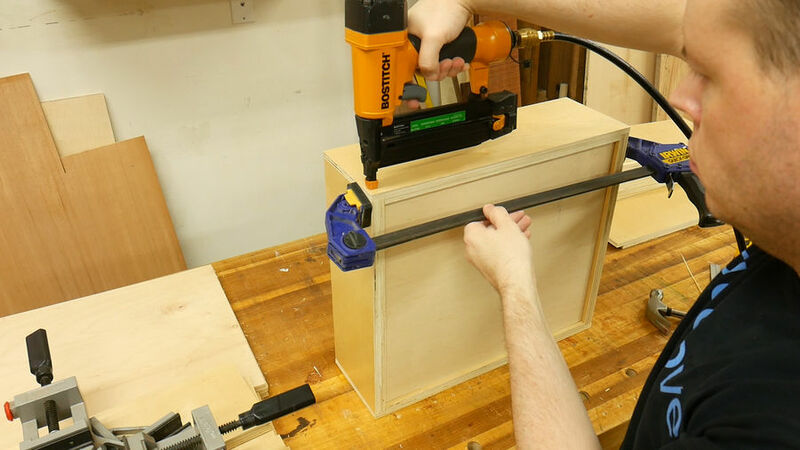 I inserted my dado stack and dialed in the perfect fence setting as you can see here. It's worth taking the extra few minutes to dial everything in. 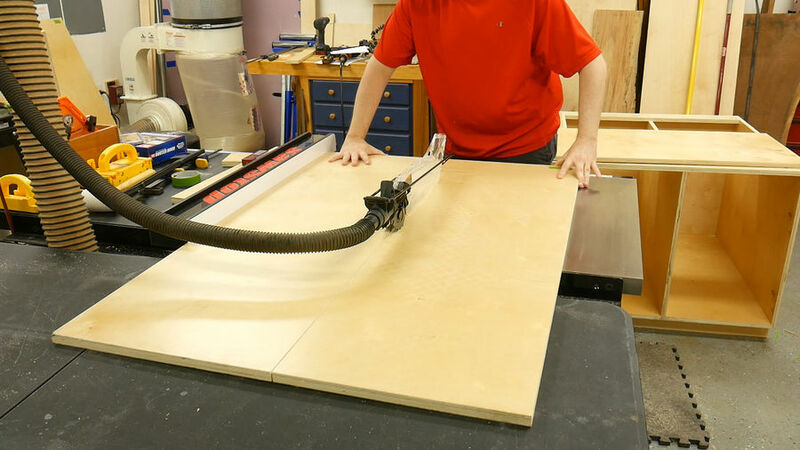 To cut the half lap I use my miter gauge and remove the waste using the dado stack. 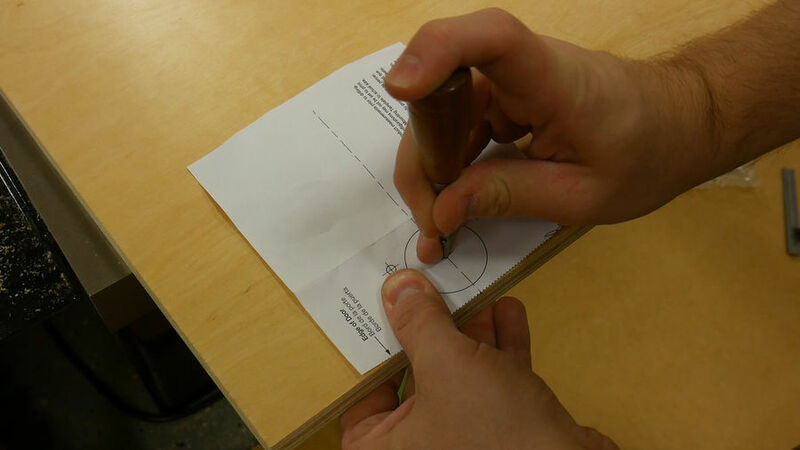 I rotate the board and remove the waste from the opposite side. I did this operation on 16 of the 32 box parts. 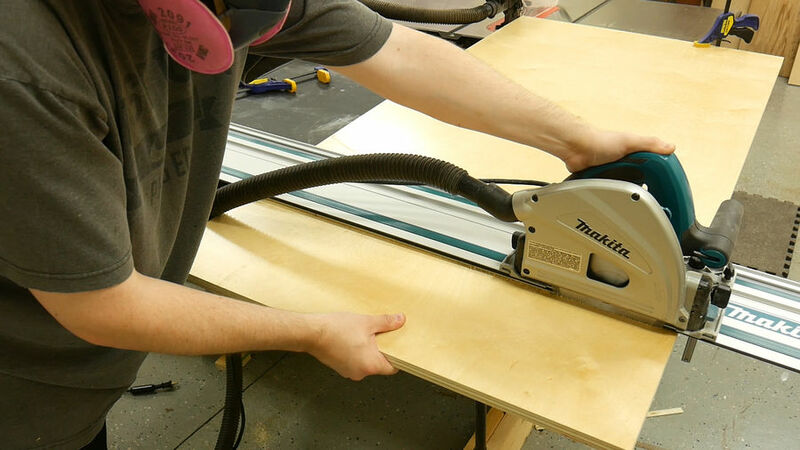 Next, I switched the dado blade to a quarter inch and set the fence back a quarter inch from the blade and cut a groove for the bottom panel. I made this cut on all inside faces of the 32 box panels. 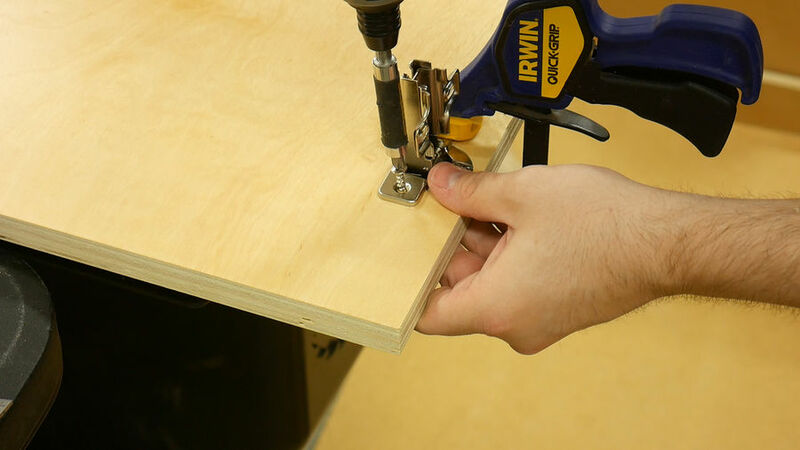 To assemble the drawer boxes I like to use these right angle corner clamps. 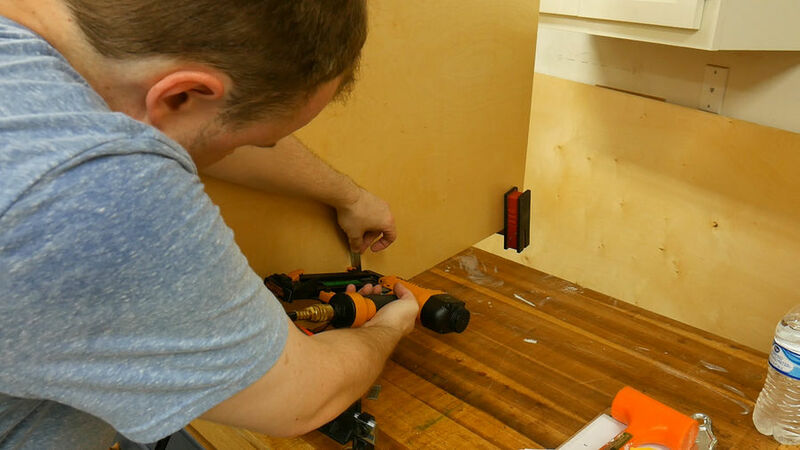 They help hold everything in place while nailing the corners. I opted to not put any glue in the corners but instead just used nails. I put 3 nails in each corner and then removed the clamps. 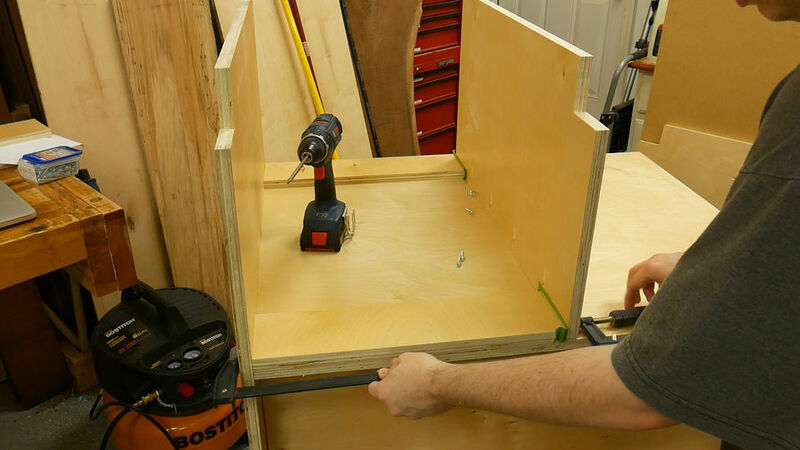 Next I slid the bottom panel in and clamped the back panel in place to hold it while I shot the nails. After shooting 3 nails in the four corners, I rotate the box and shoot 3 more nails on the opposite corners to give me a total of 6 nails in each corner. More than strong enough for shop drawers. 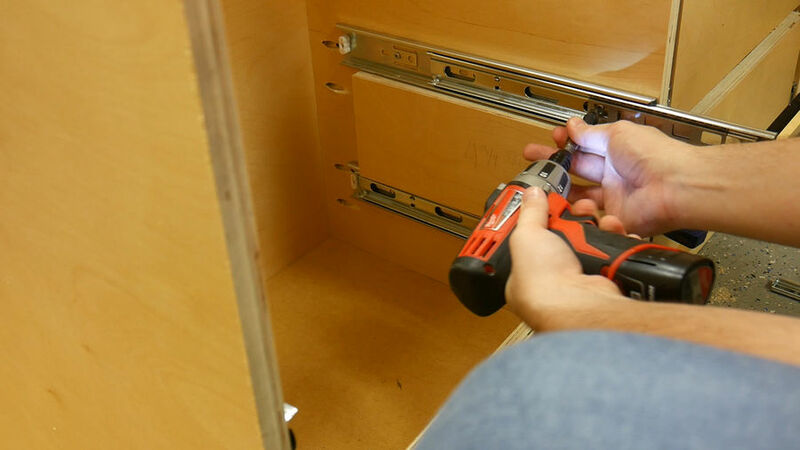 To install the drawer slides I cut a spacer to 3 1/8" wide to fit inside the cabinet. This spacer is only used for the bottom drawer. 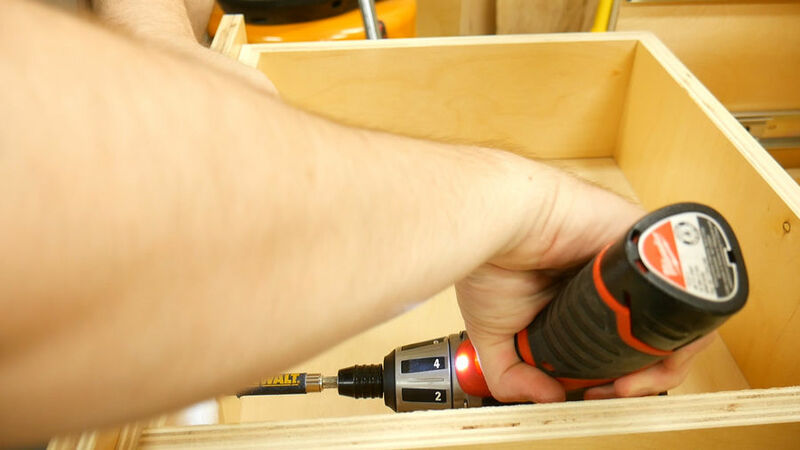 Next I set my combination square to a 16th and pushed the drawer slides back from the face of the cabinet and then installed the 3 screws provided with the drawer slides. 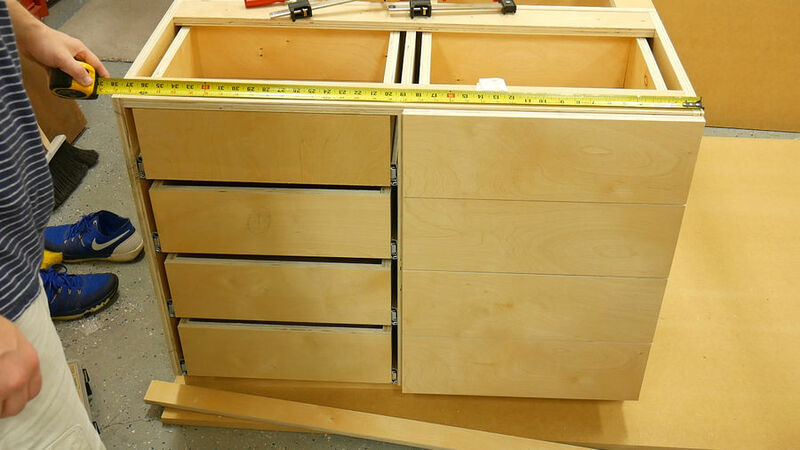 For the remaining drawers I switched to using a 4 3/4" wide spacer. Just like before, I place the drawer slide on top of the spacer, set it back a 16th from the edge and installed the screws. I keep doing this until all 8 drawers are installed. 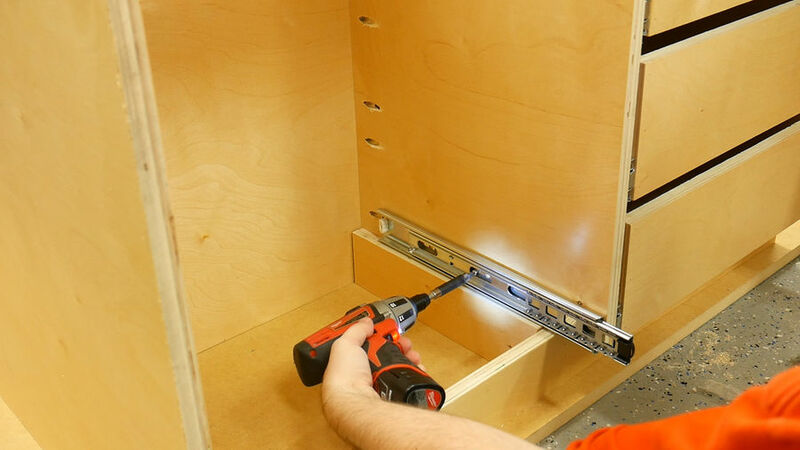 To install the drawer fronts I again used a spacer to make this job not only faster, but more accurate. This spacer is 4 1/8" wide. 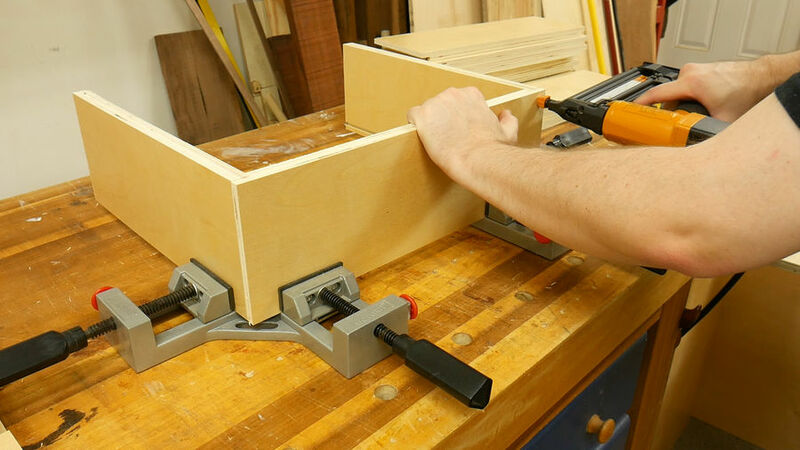 I clamp it in place and push the slide up against the spacer and make the end of the slide flush with the edge of the drawer. And just like before, I install the 3 screws. 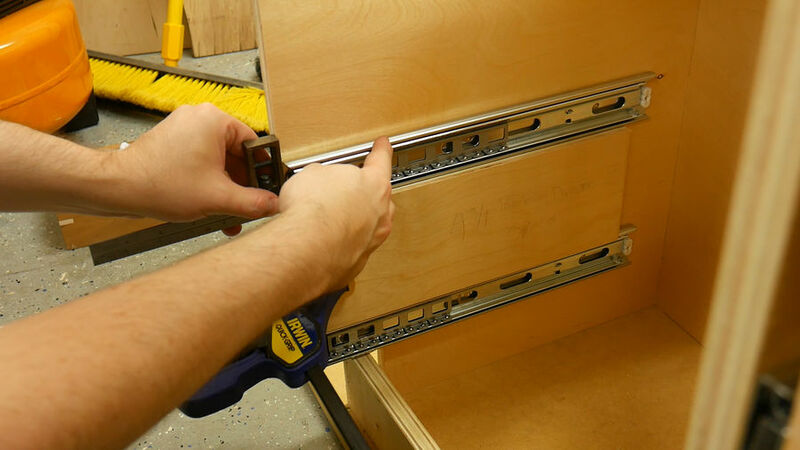 I then remove the clamps, flip the drawer box over and repeat the same steps for the other side. Using spacers were a real time saver in this project. 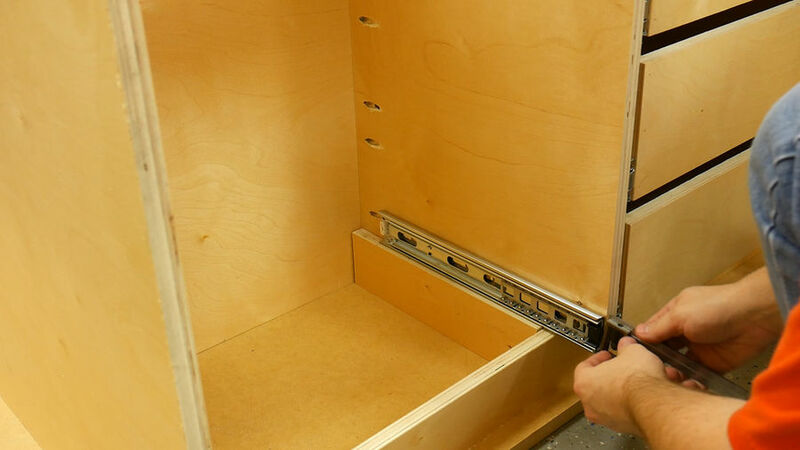 Before cutting the drawer fronts I measured the opening of the cabinet to get my dimensions. 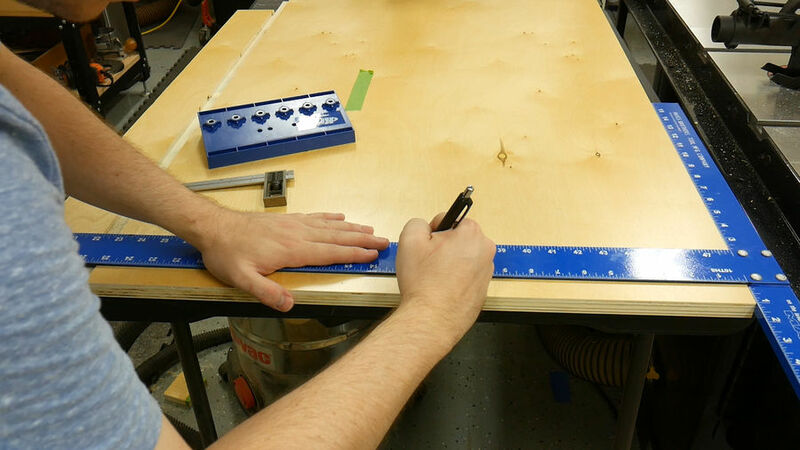 It's always best to measure the actual project pieces instead of going off of the plans. 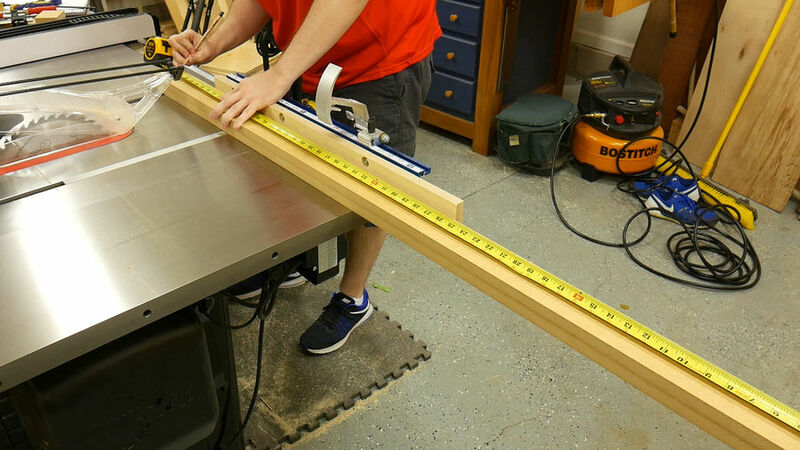 With that measurement in hand I cut the false drawer fronts to width and length at the table saw. 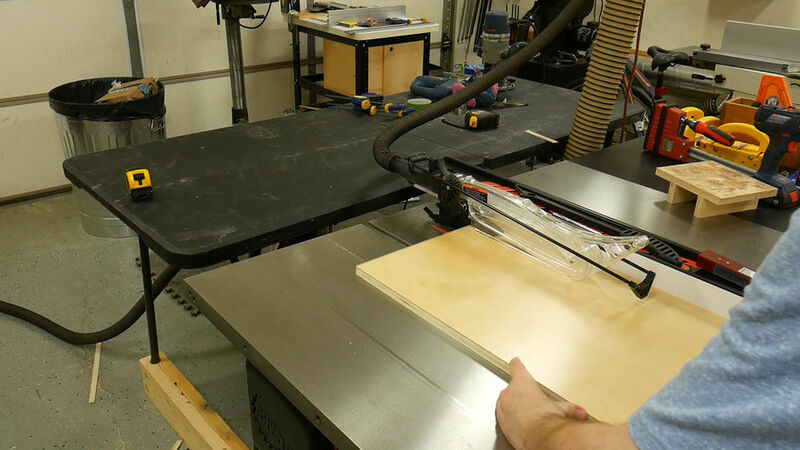 For grain continuity I cut 4 drawer panels out of one big piece of plywood. 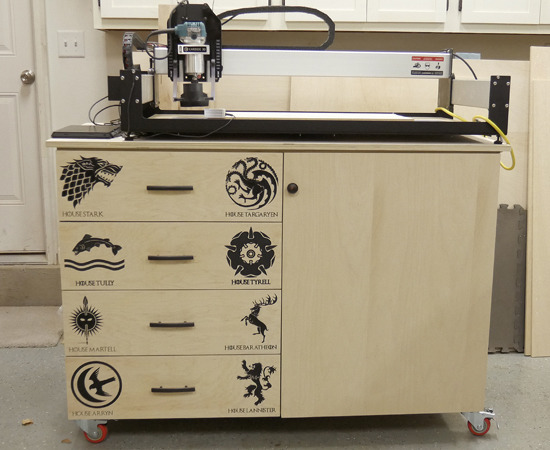 This adds a little to the appearance of the drawers. Had I done a better job of breaking down my plywood, I could have gotten all 8 drawer fronts out of 1 piece, but it's not too bad. 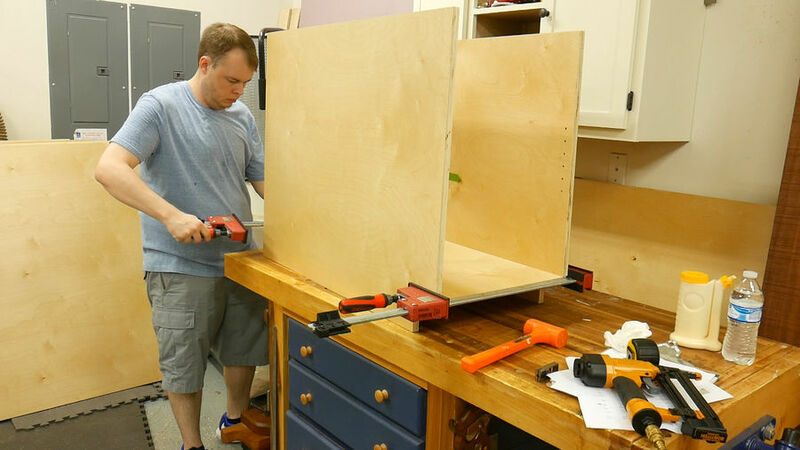 Before attaching the drawer front I countersink two holes on the inside face of the drawer box to use for attaching the false fronts. 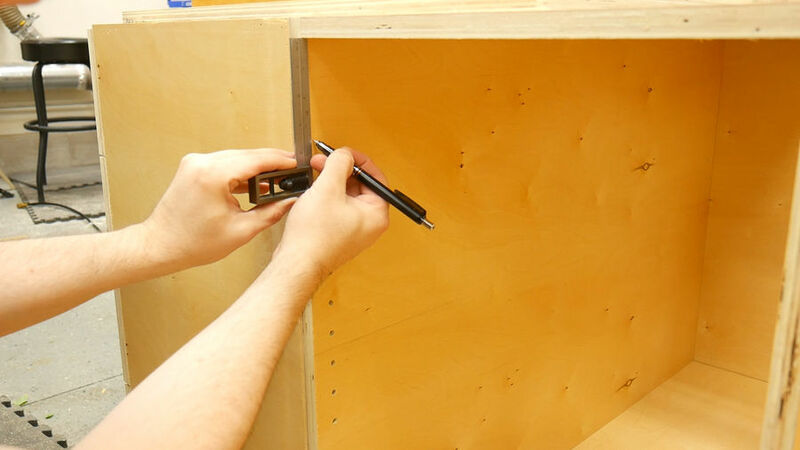 Then I clamp a scrap piece to the bottom of the cabinet to set the drawer front on. 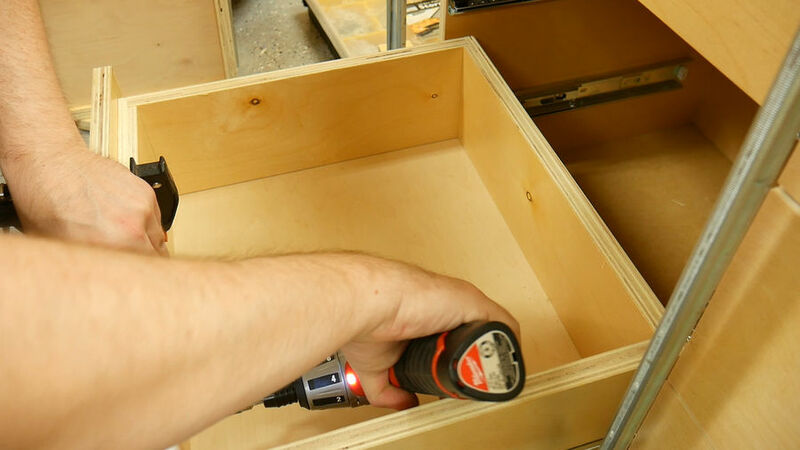 This ensures that the drawer front wont drop below the toe kick and helps keep things consistent. 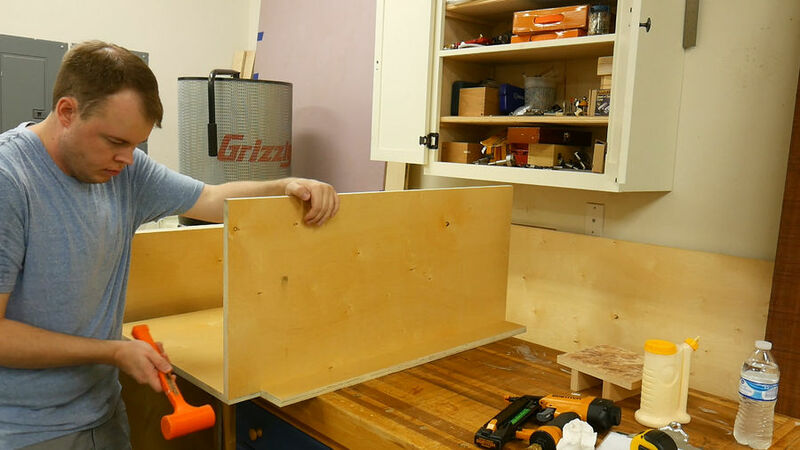 Next, I place the drawer front on the scrap board and make sure it is flush with the left side of the cabinet. 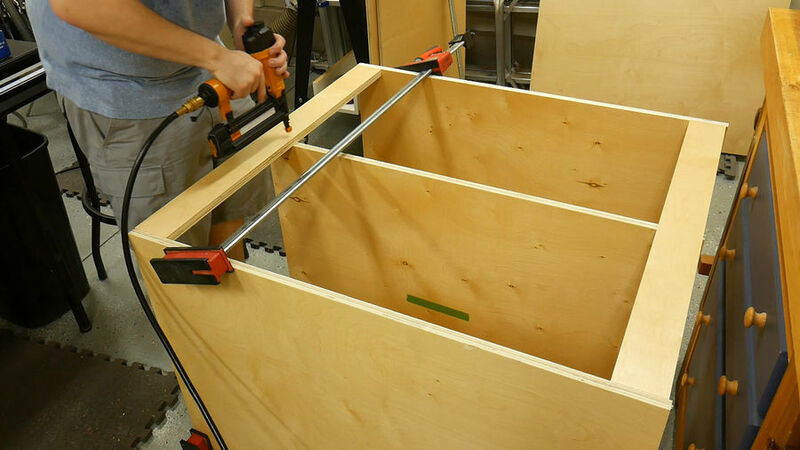 With everything flush, I add two clamps to hold the drawer front in that exact location and install 2 screws. Moving forward I placed an 1/8" shim on the drawer below the one i'm working on to give each drawer front a consistent gap between the drawers. 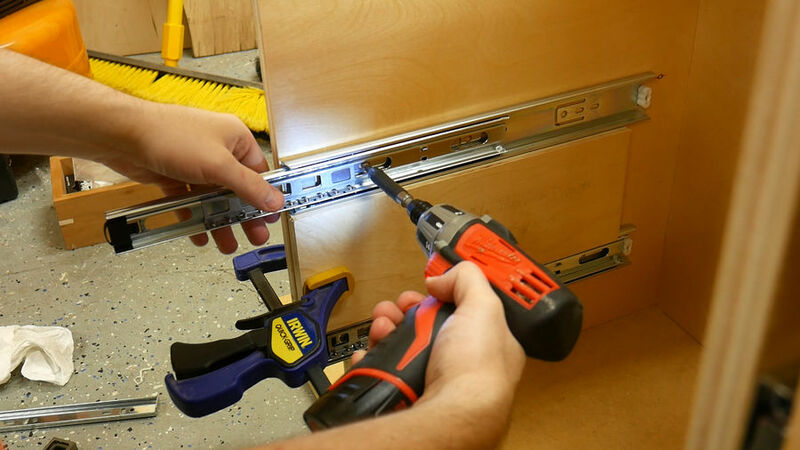 With the drawer front flush with the side of the cabinet, I clamp it in place and again screw in two screws. 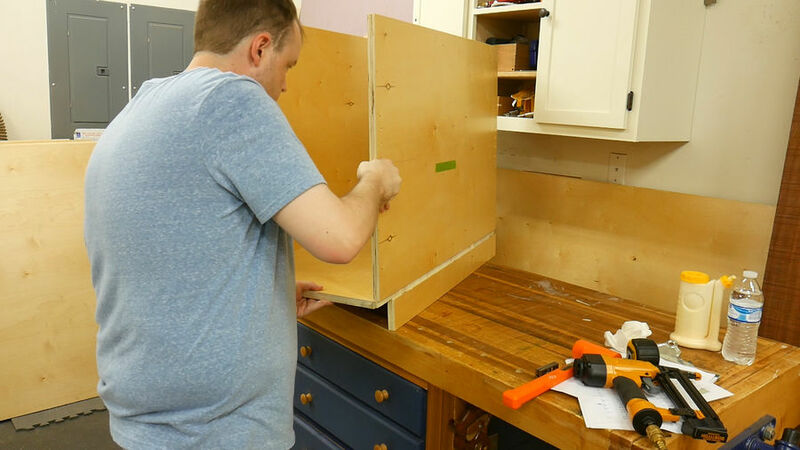 Next up I tackle the cabinet doors. 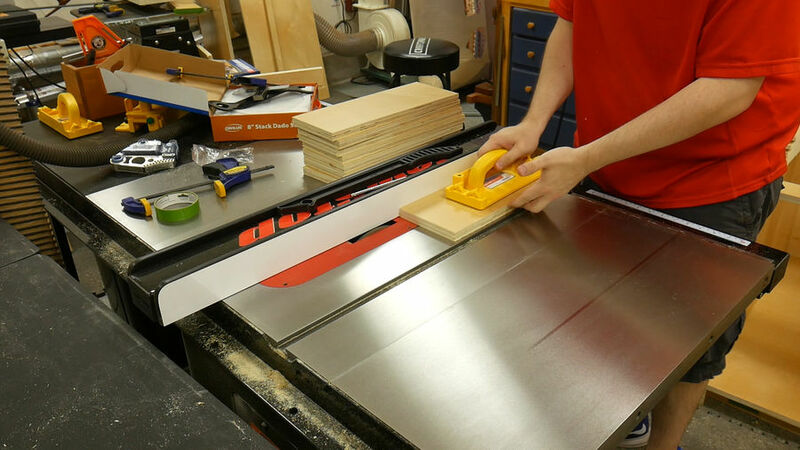 I cut them to width and then length at the table saw. 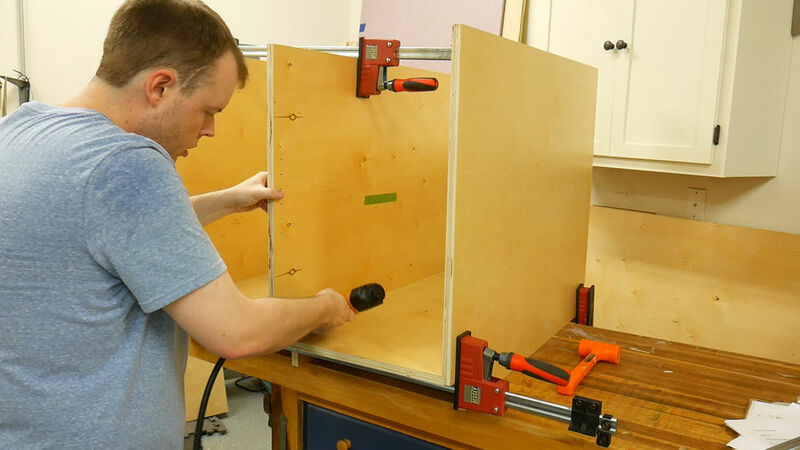 There are several ways to install the hinges and this is just the method I used. 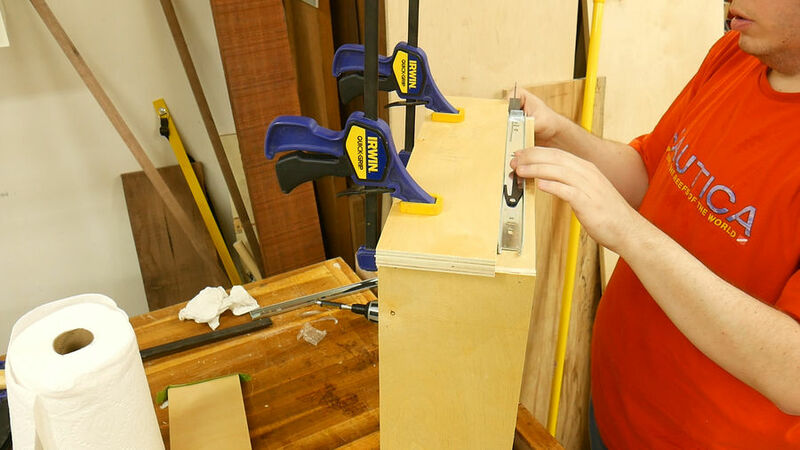 To begin, I make a mark on the cabinet 3 1/2 inches down from the top and 3 1/2 inches from the bottom. Next I line up the hinges on the center line and install the screws. 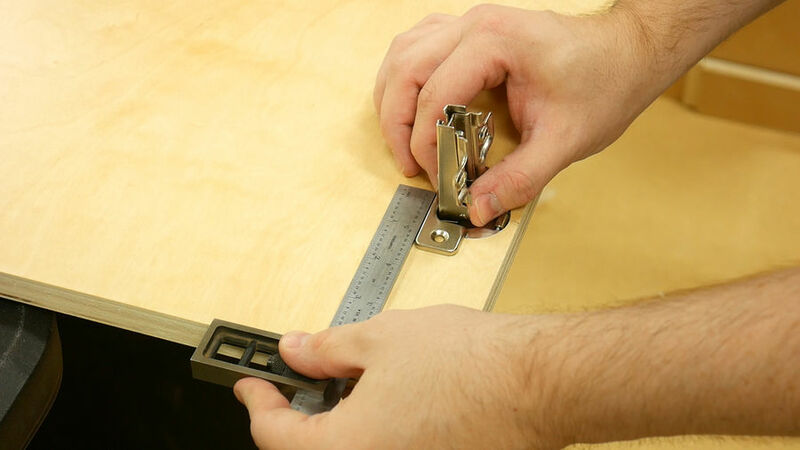 This step is optional but I find it easier to do now instead of trying to install the screws with the hinges on the door. 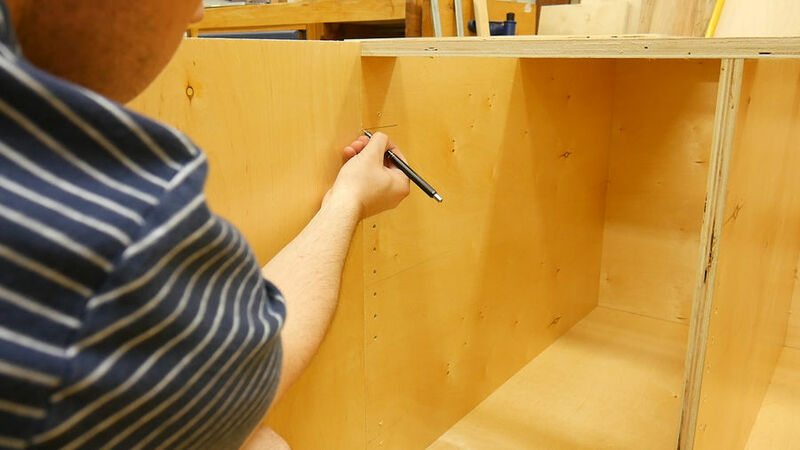 To make reference marks on the door, I place the door on a spacer that raises the door to make it flush with the top of the cabinet and transfer the marks to the door from the cabinet. 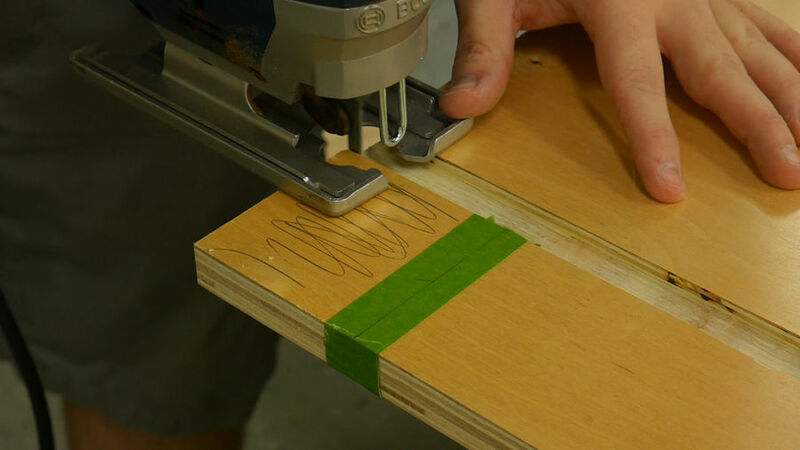 Next I line up the center lines with the template that came with the hinges and using my scratch awl, I make a mark on the door. 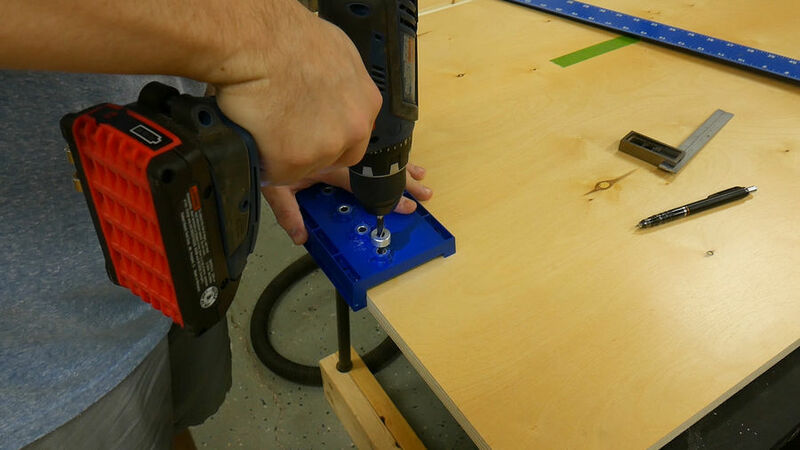 The hinges require a 35 millimeter bit but I didn't have one so I used a 1 3/8" forstner bit to drill the holes. 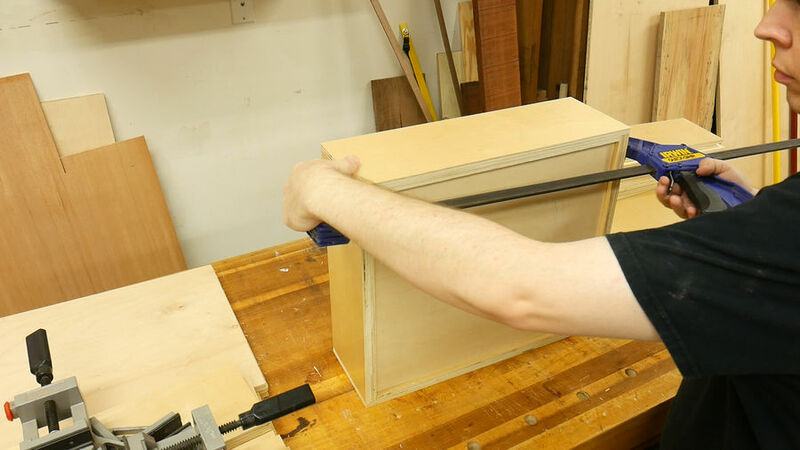 Next I placed the hinges in the hole and using a combination square, made sure they were square to the edge of the door. 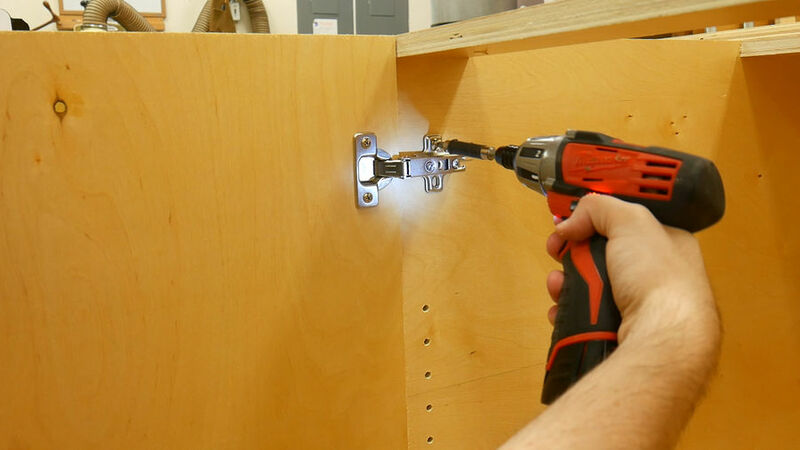 I placed a clamp on the hinge to hold it in place and installed the screws. Finally, I placed the door back on the spacer and re-installed the hinges. 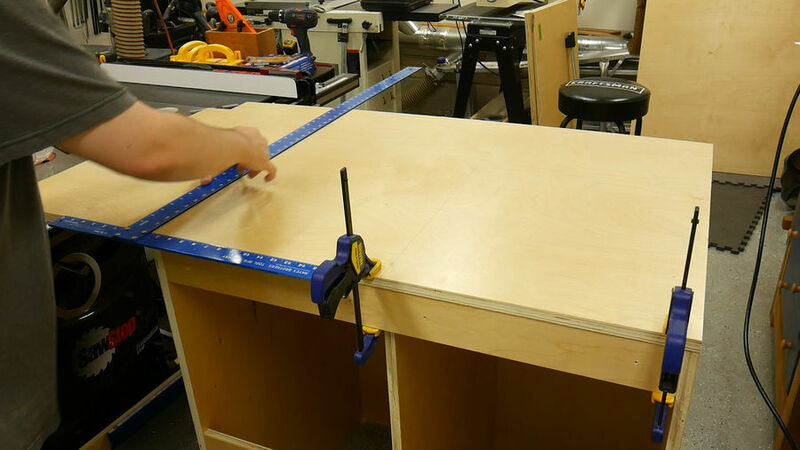 Since my garage floor isn't level, and because the assembly table is lower than my table saw, I installed 4 leg levelers on the assembly table so I can raise the height and level out the table. With the base done, I move on to building the torsion box top. 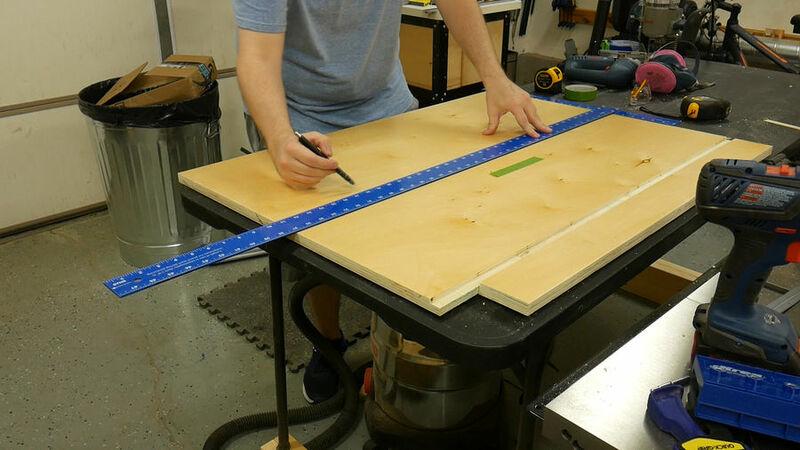 I cut all of the grid parts the width of 2 1/2" and now I needed to cut them to length. 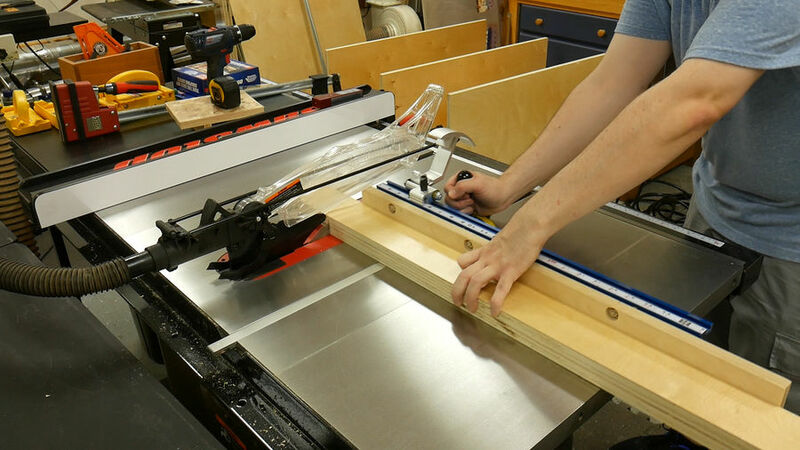 I begin by cutting the divider pieces to 46 1/2" long using a stop block on my miter gauge. 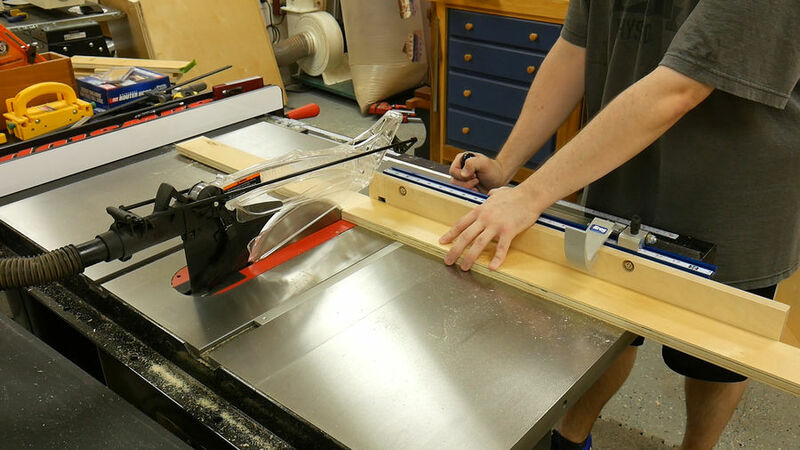 Next since I cut the two longer strips at 60 inches and since there were only two of them I didn't use a stop block. And finally I batched out the 46 grid pieces to 7 23/32" long. 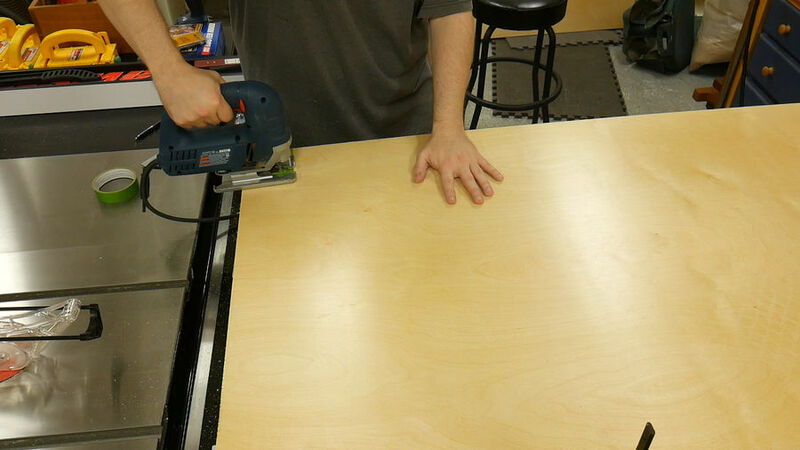 Before I started working on the top, I jointed two edge of 6 2x4's to give me a dead flat surface to build my table. I used my longest straight edge to confirm everything was dead flat. If I had any gaps, I placed a shim under the 2x4. 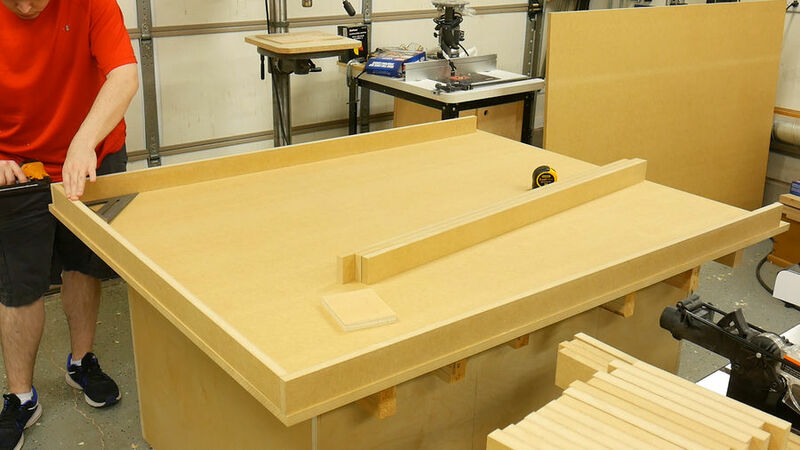 Next I placed one of the oversize panels on the 2x4's to begin building the grid. 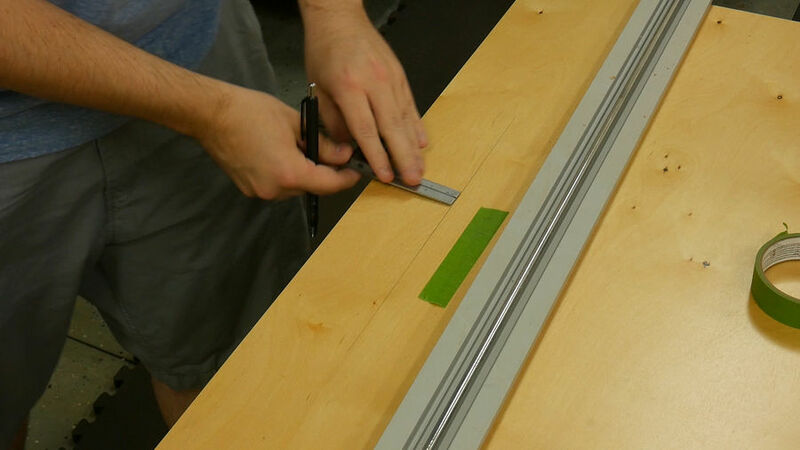 I begin building the grid by nailing one divider to the longer rails with 2 inch brad nails. To keep everything equally spaced I cut a spacer to 5 5/32 long to place between each grid piece. With the grid piece in place I attached it with a few brad nails. I continued this process for the first row of the grid. Next I slide in another divider piece and attach it to the grid. Every other row I would start off with a larger spacer to offset the grid, so the second row I placed an 8 7/64 long spacer in first and then put the grid piece in place. After the first grid piece is nailed in place I can then go back to the original spacer to set the distance between grid pieces. I kept alternating spacers until the entire grid is complete. Before attaching the top I put glue on the top edges of the entire grid. With the help of a friend (Or in my case my dad), I placed the top sheet on the grid and attached it with brad nails. 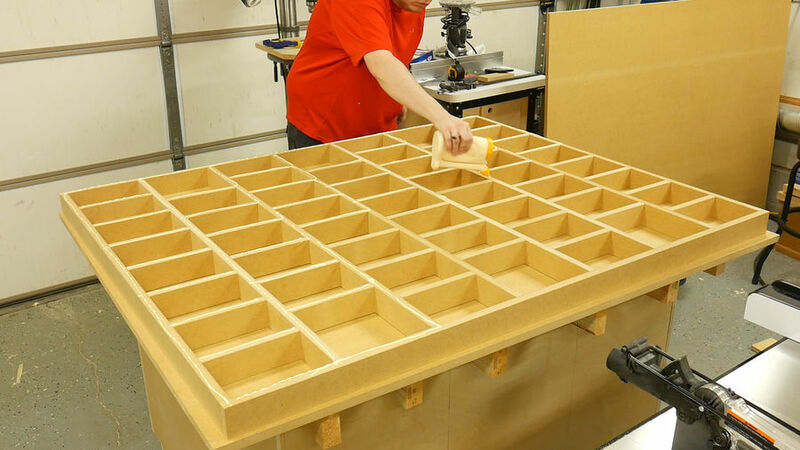 After the glue set up, I flipped the top over, spread more glue on the grid and installed the bottom panel again with brad nails. 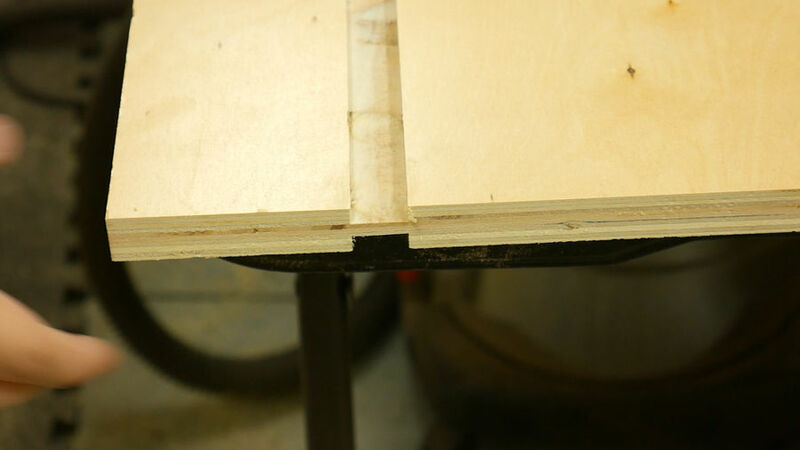 Since I cut the top and bottom panels oversize I needed to remove the excess so I installed a flush trim bit in my router and flushed up both sides of the top. 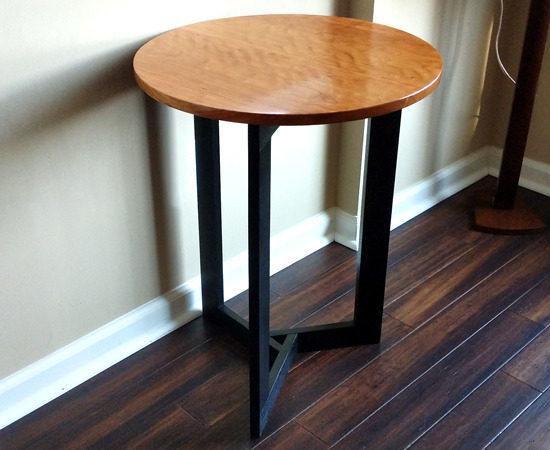 I wanted to attach hardwood around the edge of the table to help protect it from abuse. I went with cherry since I had some in the lumber rack already milled to the correct thickness. 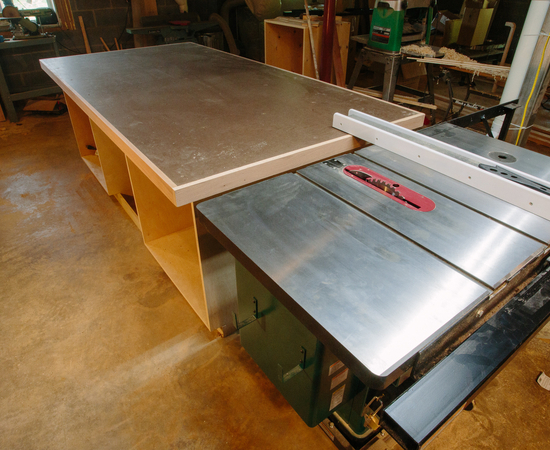 I cut it to 4" wide at the table saw and then to length at the miter saw. 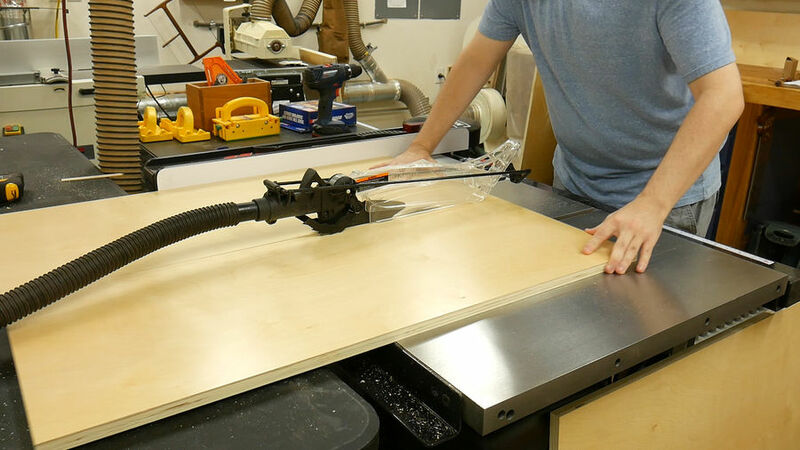 I clamped a scrap board to the edge of the table to aid in installing the hardwood trim. 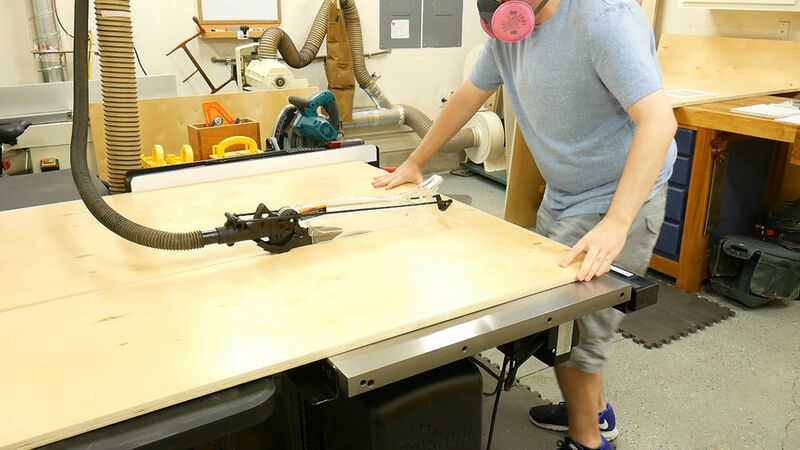 This ensured that the board will be flush with the bottom of the top. Again, I used brad nails to attach the hardwood trim. After installing the hardwood edging I used my block plane to flush everything up. 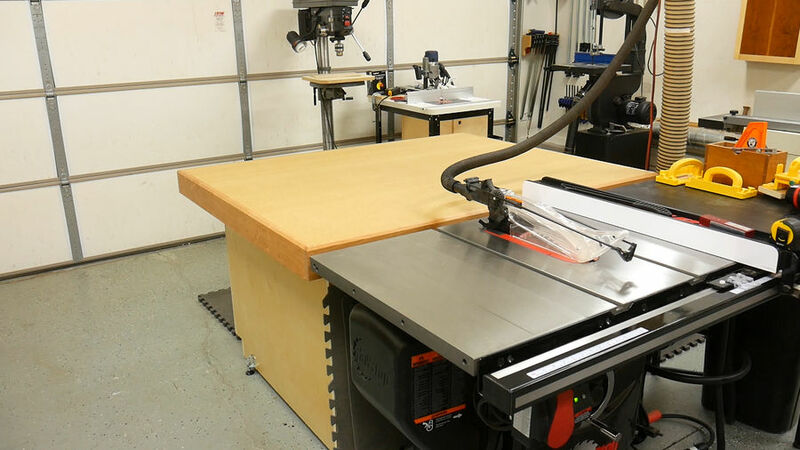 To ease the edge of the hardwood I routed a chamfer using my plunge router. To protect the top from things like glue and finish I applied two coats of a wipe on polyurethane. This just happened to be what I had on hand from a previous project. You could apply a water based poly just as well. I applied a total of two coats. 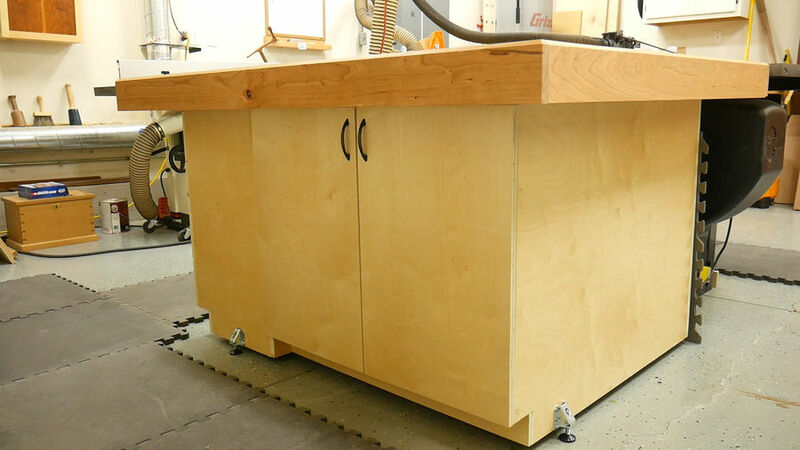 Thanks for checking out the assembly table build. Don't forget to download the free cutlist if you want to build one. The link is in the description above.